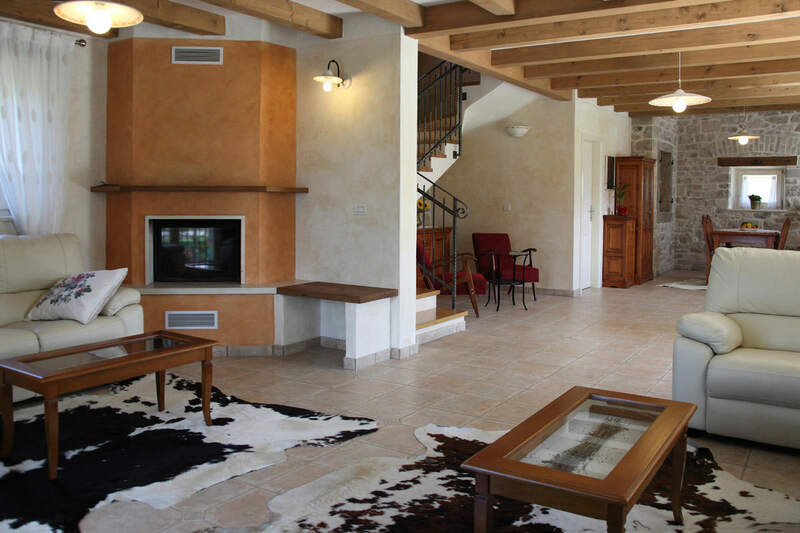 Check in is from 4 p.m., check out till 10 a.m.
Accommodation fee, electricity, water, heating and cooling are included in the rental price. 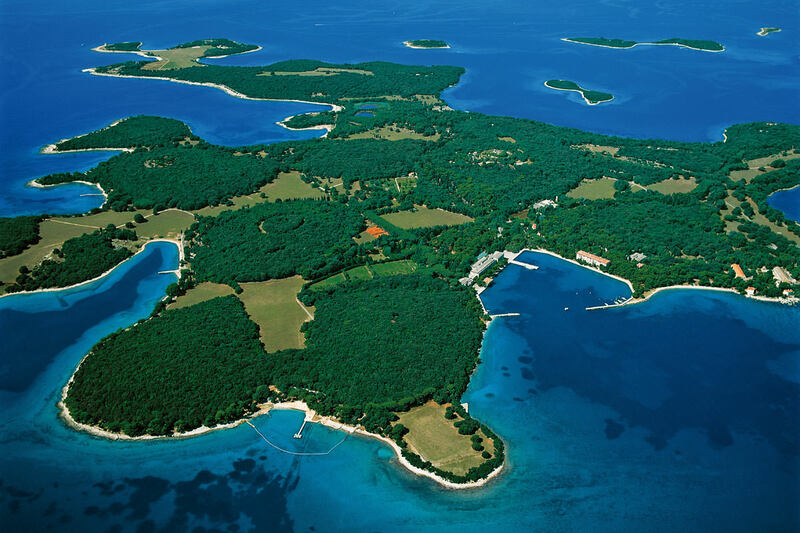 Istria, Terra Magica, is an enchanting land of green landscapes, ancient hilltop towns, good wine and olive oil. 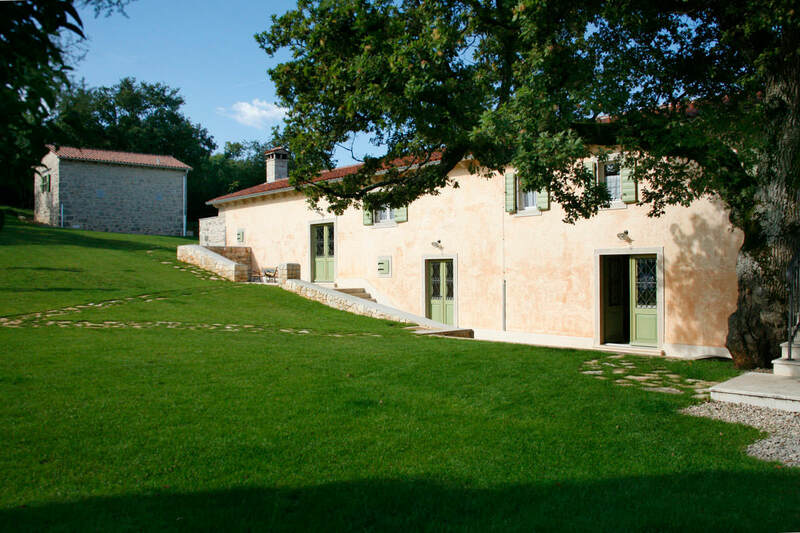 Experience the Istrian peninsula in a traditional country house refurbished in original style with a touch of modern luxury. 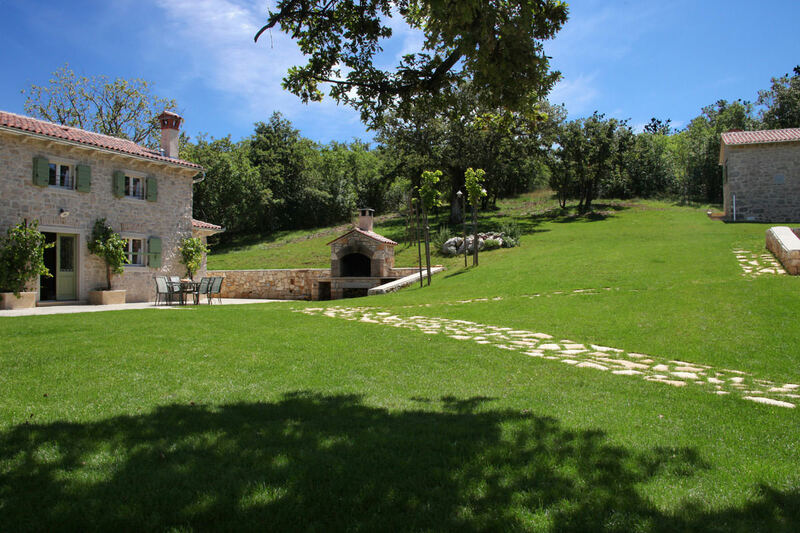 Visit Morchaki Country Resort & Spa and escape your daily routine in a natural environment that will heal your body and soul. 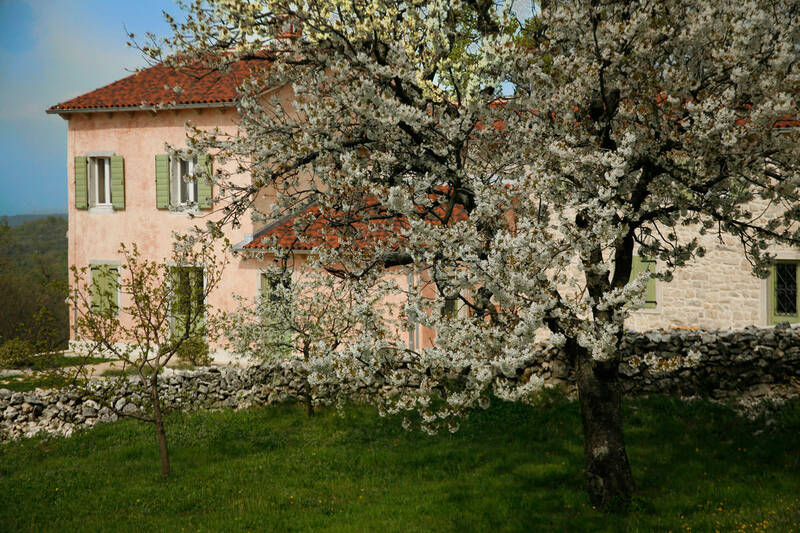 Fruit trees blooming in the spring, the warm colours of autumn, or winter relaxation in a sauna or by a traditional fireplace with a glass of good wine: every season is just perfect for a stay here. 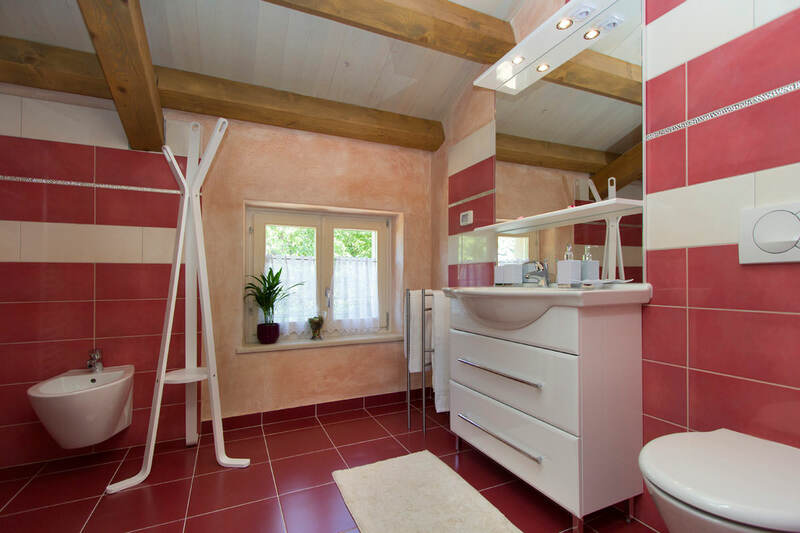 Choose the one that suits you best. 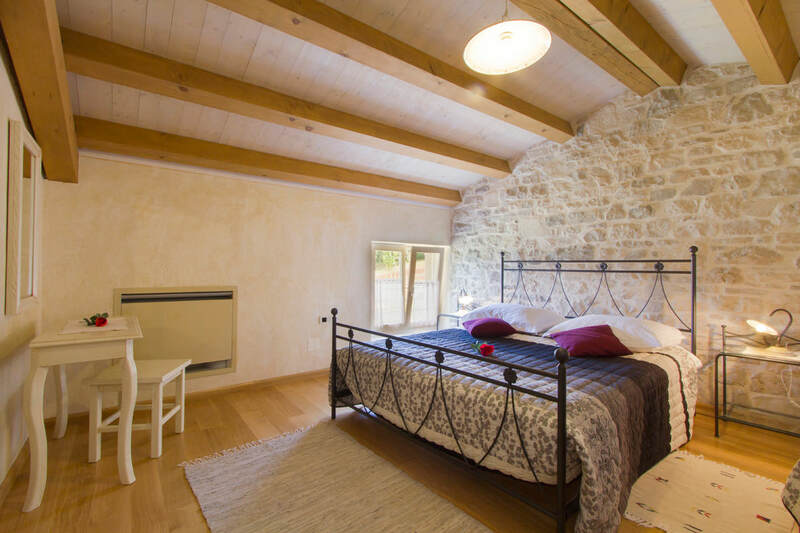 Morchaki Country Resort & Spa is a holiday cottage located on an estate that stretches as far as the eye can see, and which offers exceptional privacy in surroundings of olive groves, meadows and forest. 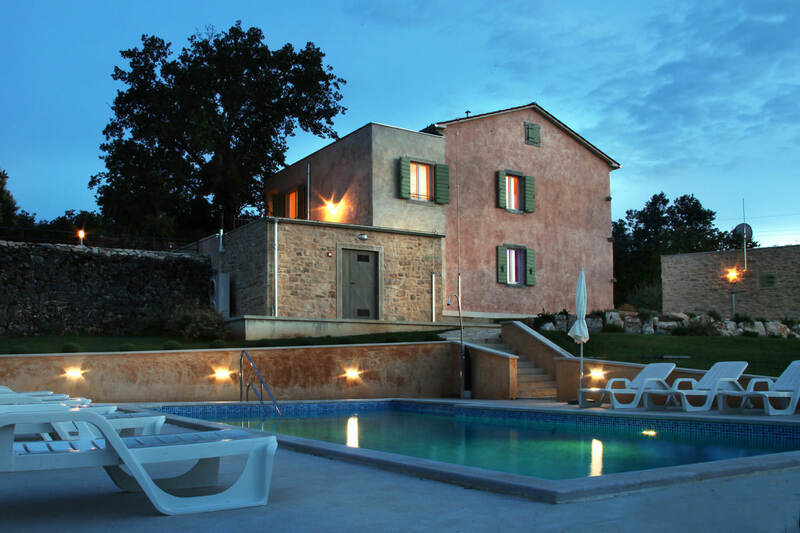 This wonderful place on the eastern coast of Istria is the perfect choice for larger families or groups who appreciate privacy and who are looking for an environment in which their children can play safely. 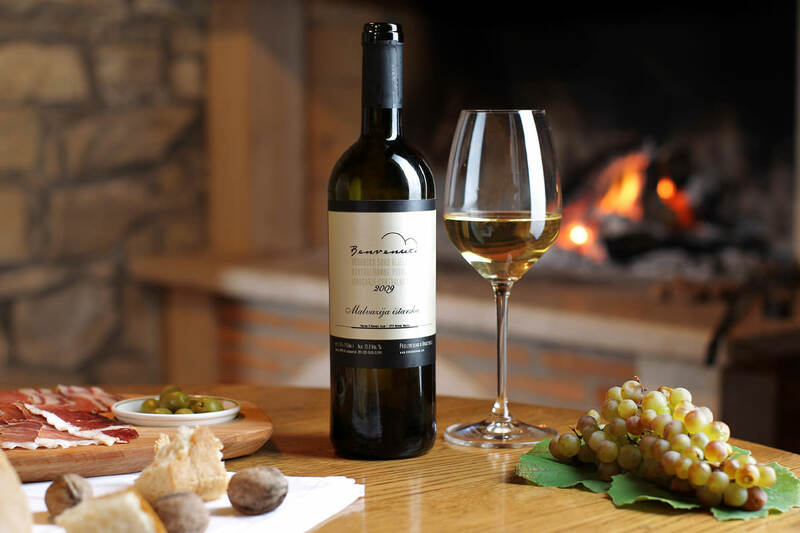 The name Morchaki comes from the nickname of our family, which has always been involved in producing and selling wine, as well as agriculture and livestock breeding. 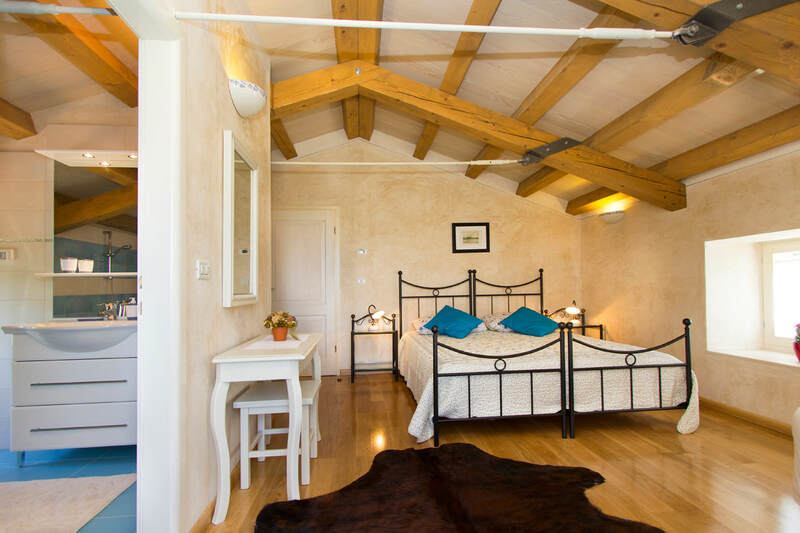 The property was built in 1880 and has now been completely refurbished to meet the highest standards of first-class accommodation. 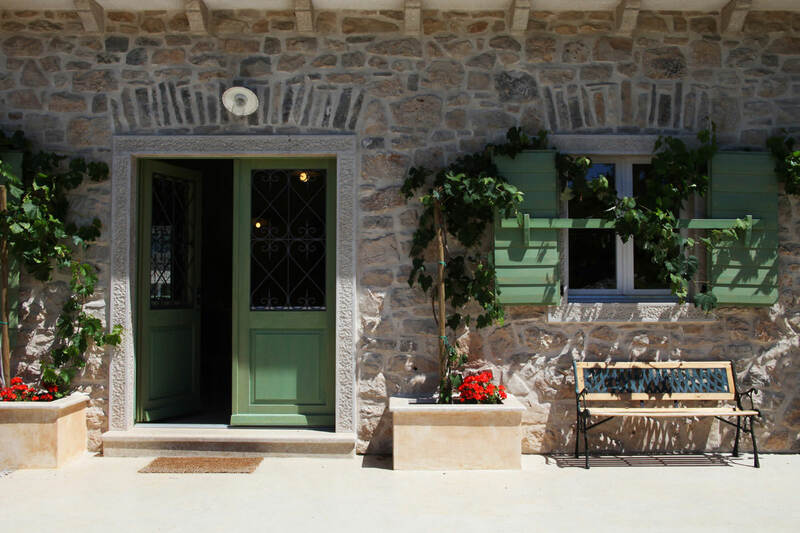 Morchaki Country Resort & Spa consists of three buildings connected by pathways inside a spacious garden. 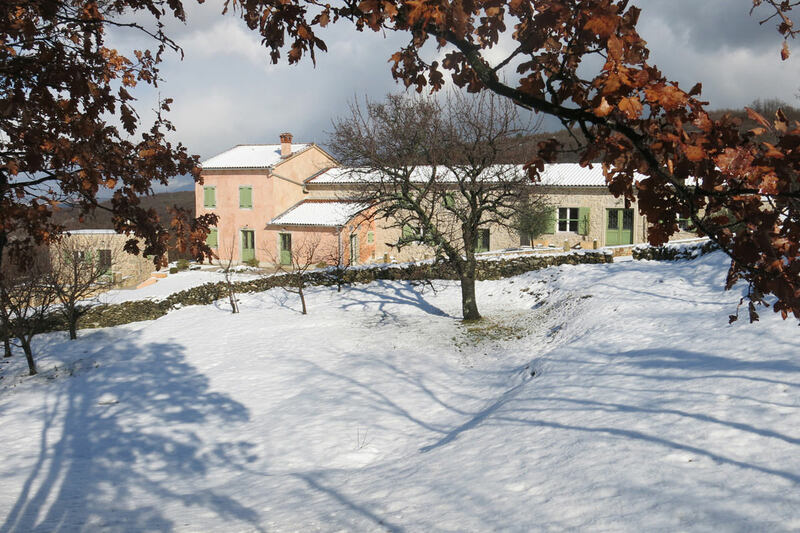 The largest among them is the former residential building, which used to have stalls for cows and sheep attached to it. 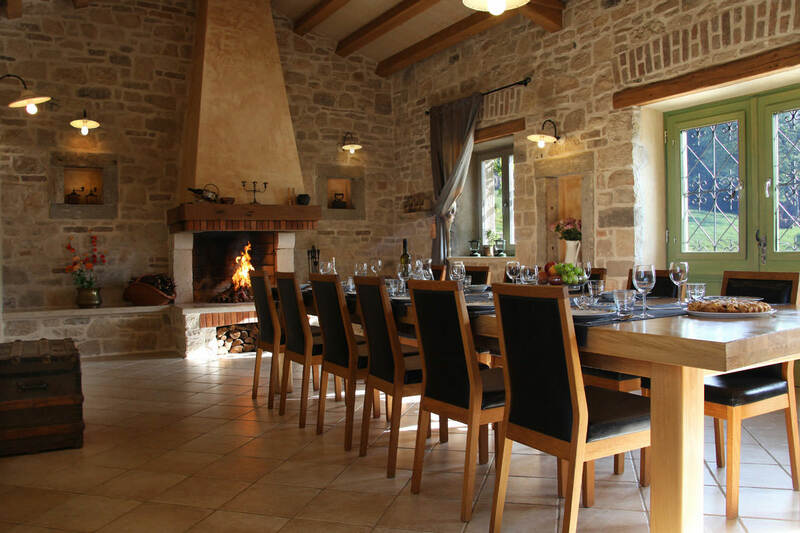 Today, its ground floor features a modern kitchen and a spacious dining room with a large fireplace and a wood-fired oven in which bread used to be baked for the family and workers who helped out on the estate. 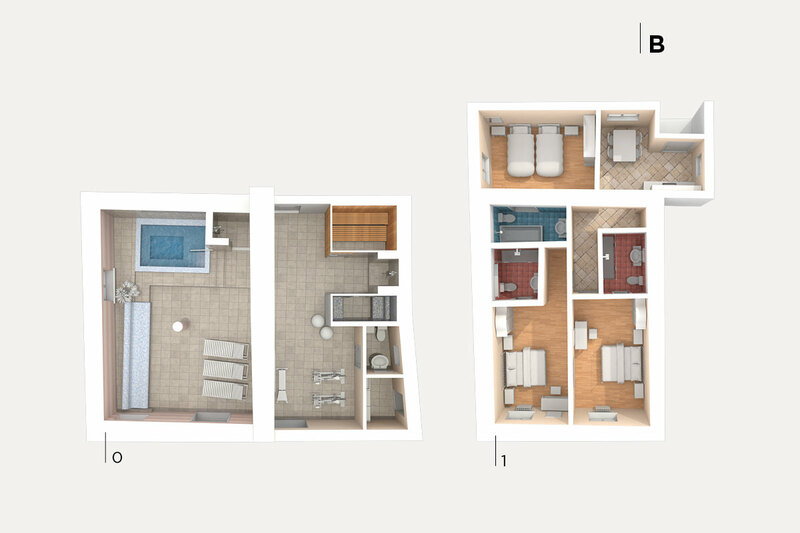 Two bedrooms are located on the first floor. 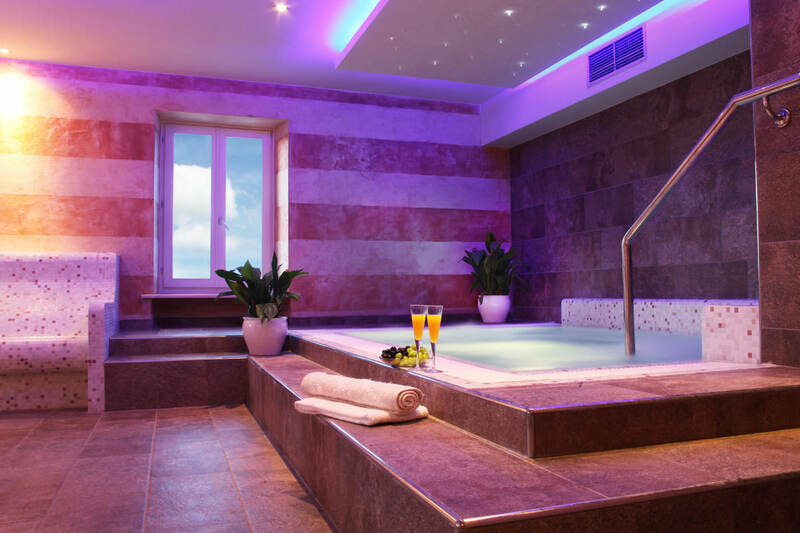 The main building also includes an impressive wellness centre with a whirlpool tub, steam bath and Finnish sauna. 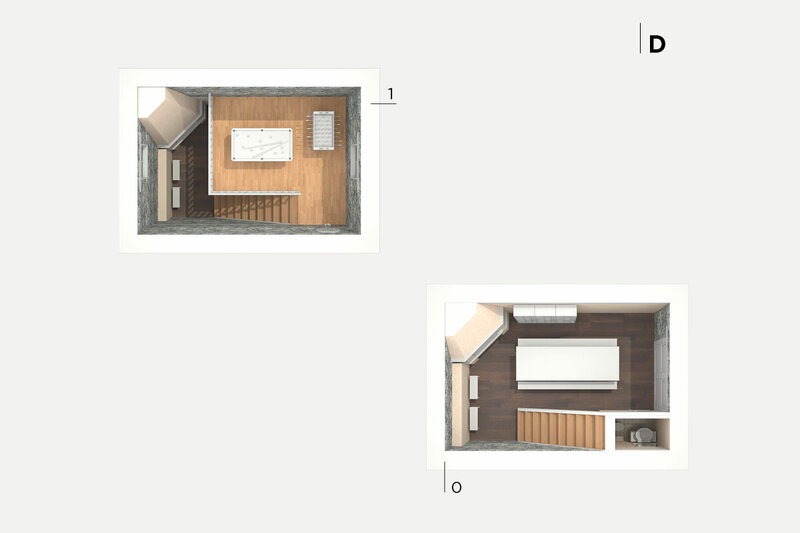 On the first floor, there are three bedrooms. 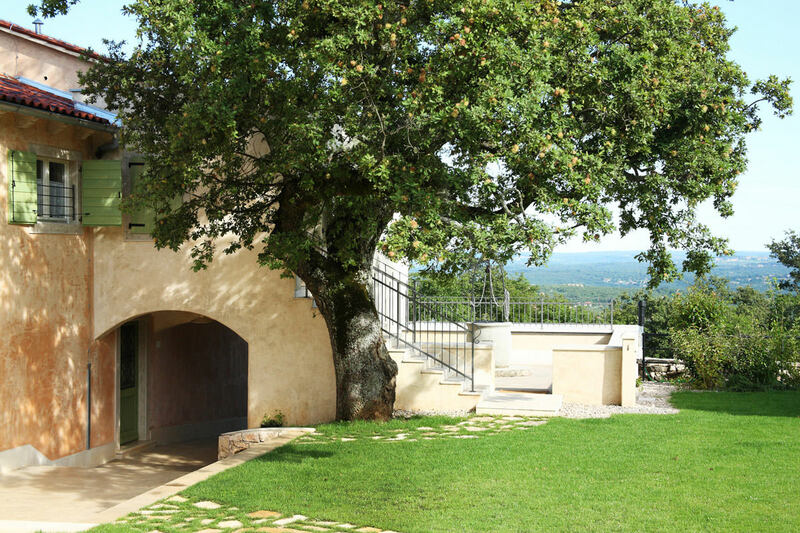 Across from the main building there is the former wine tavern and threshing barn. 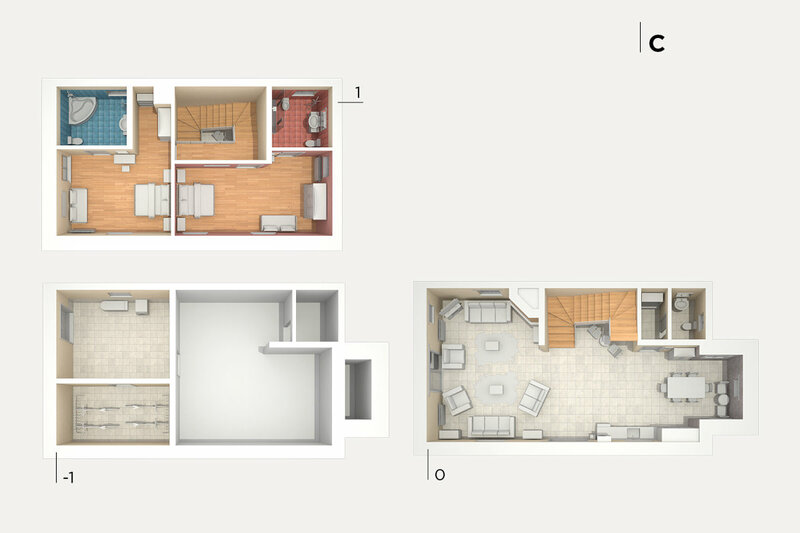 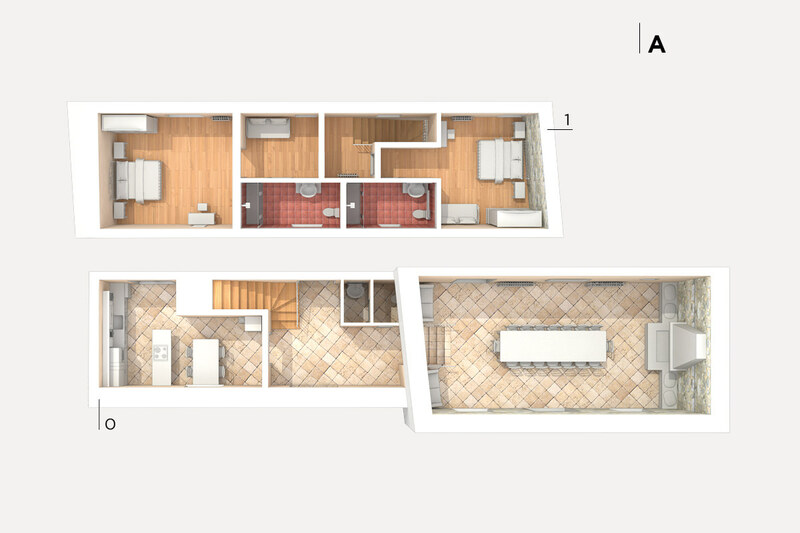 The ground floor of the wine tavern now includes a spacious living room, dining room and kitchen; on the first floor, there are two bedrooms. 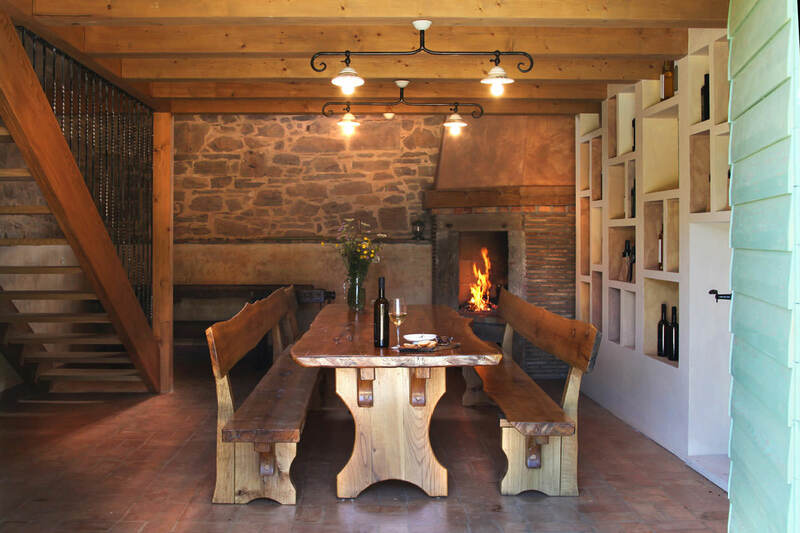 The third building, the former threshing barn, now features a tavern for wine and olive oil tasting. 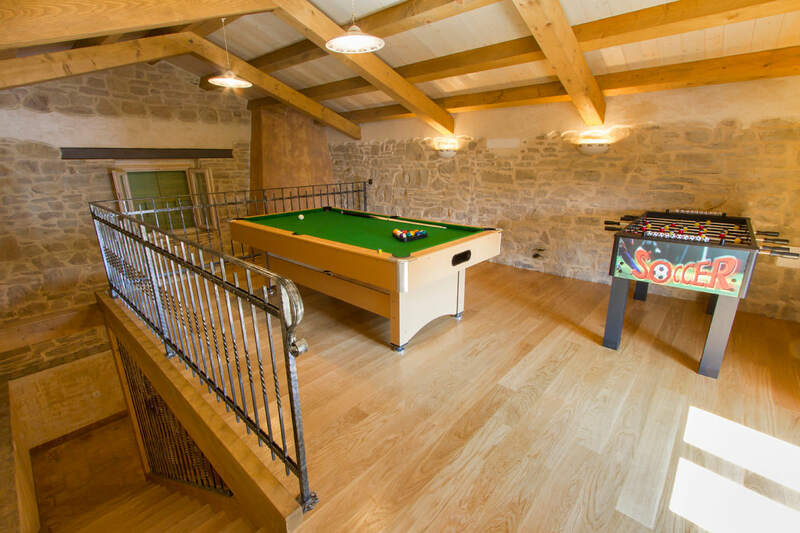 It also has a fireplace on the ground floor, and an entertainment room with facilities such as billiards, darts and table football on the first floor. 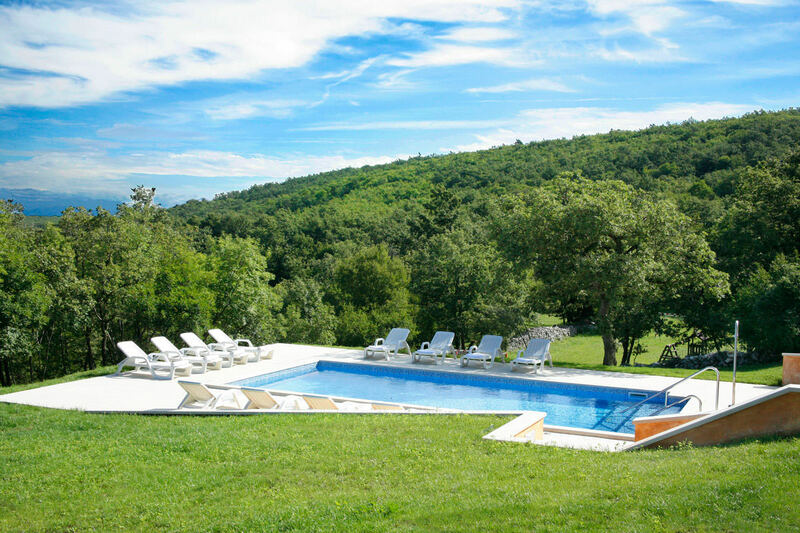 The large outdoor pool blends in perfectly with the natural surroundings and invites you to relax and meditate. 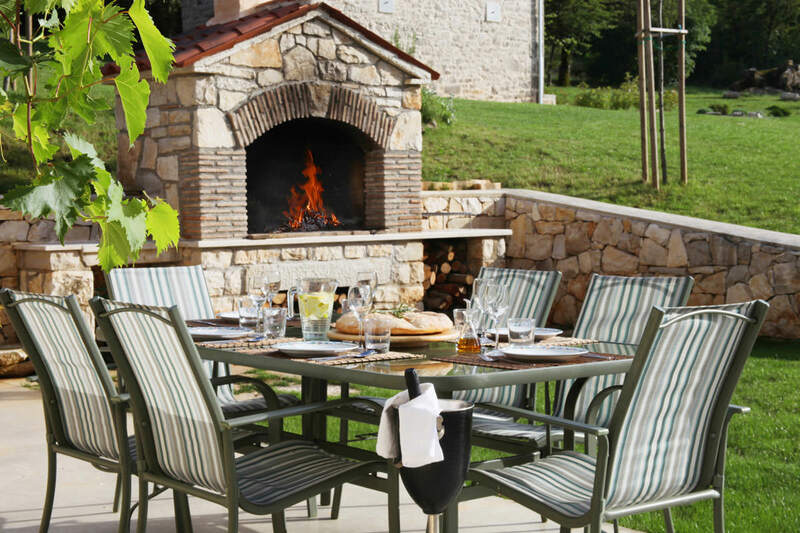 There is an outdoor grill here too. 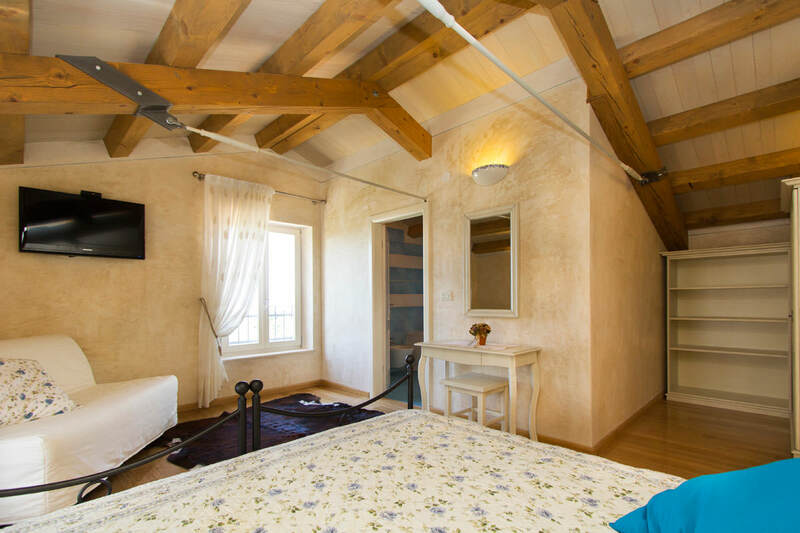 All the buildings have air-conditioning and provide complete comfort and everything you need for a fantastic holiday. 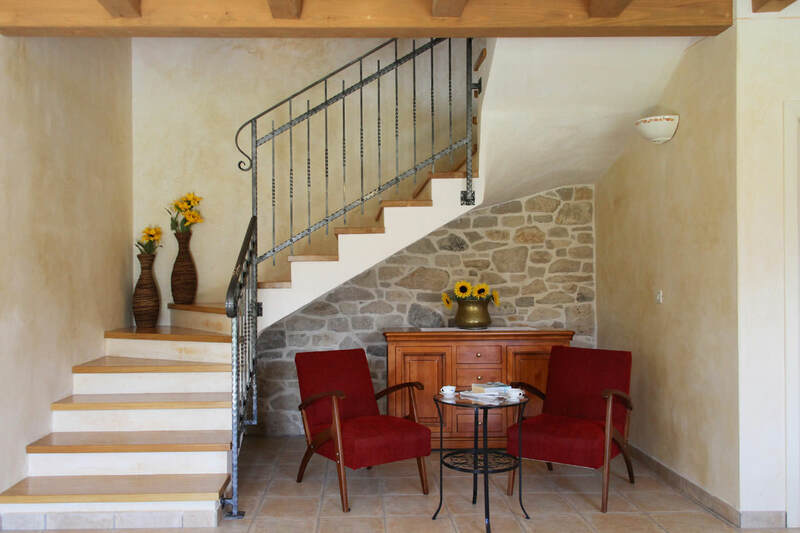 There is also free Wi-Fi if you want to stay in touch with your friends or read the news. 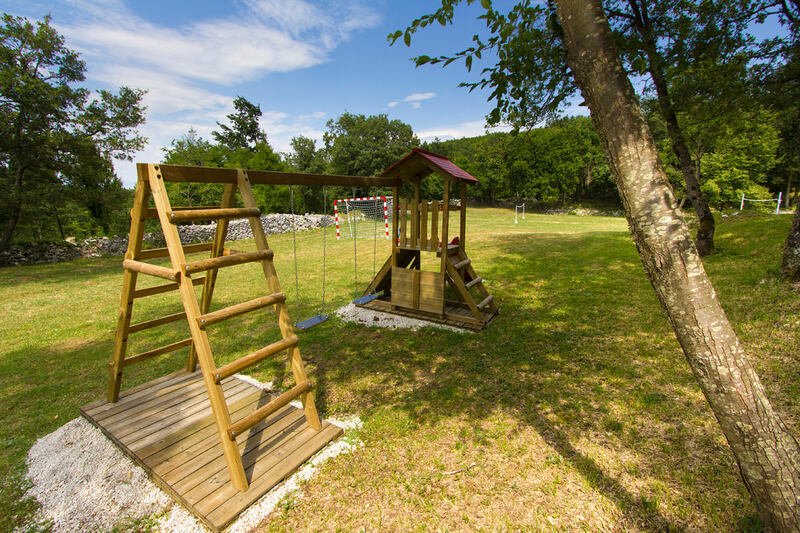 The rural ambience is perfect for children who can play carelessly and develop their imagination while exploring the farm surrounded by meadows, trees and greenery. 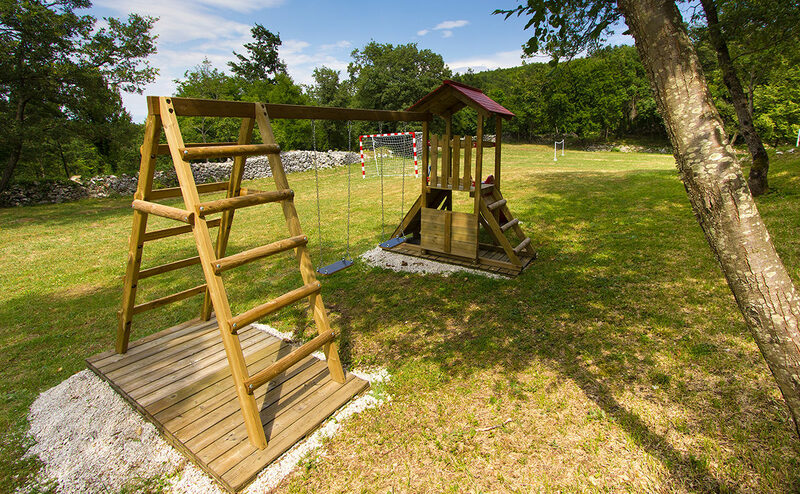 Nearby is a playground with swings and a slide, as well as five-a-side football goals and grass volleyball and badminton courts. 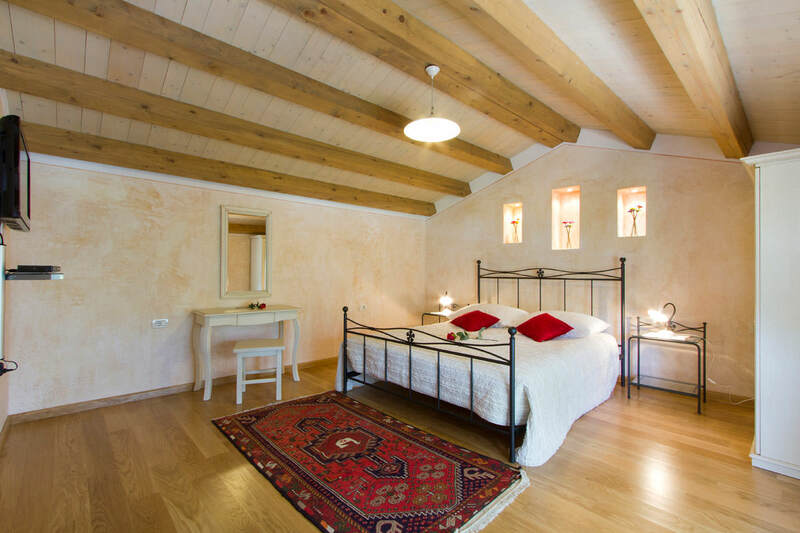 Morchaki Country Resort & Spa can be described as a wonderful wellness zone in stunning natural surroundings that have a beneficial effect on mind and body. 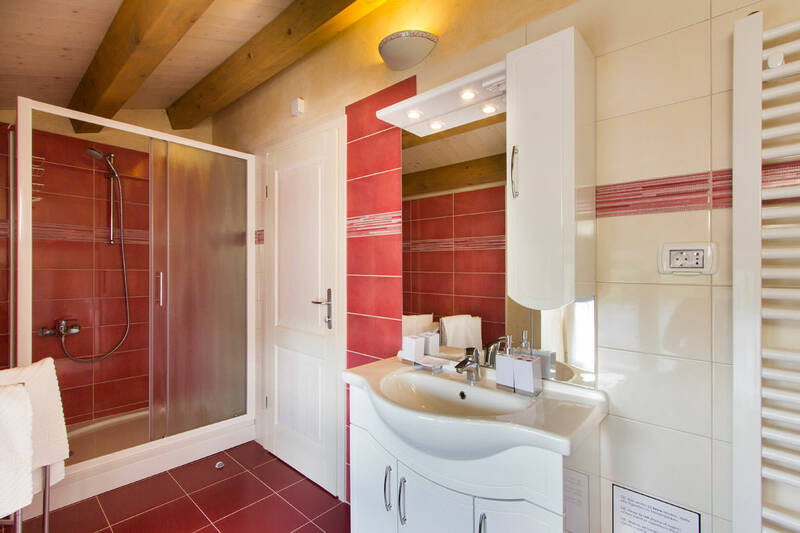 The modern services and facilities are also designed to help you relax and renew your energy. 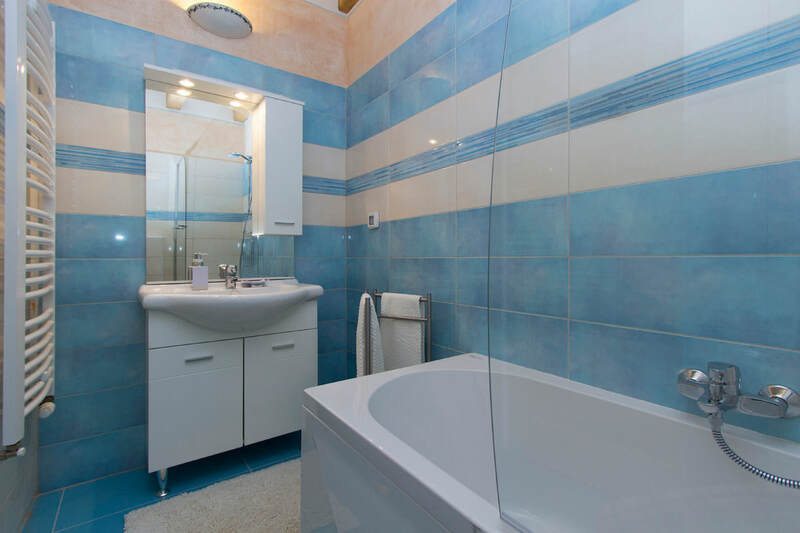 Apart from a whirlpool tub, steam bath and Finnish sauna, we can arrange a massage of your choice. 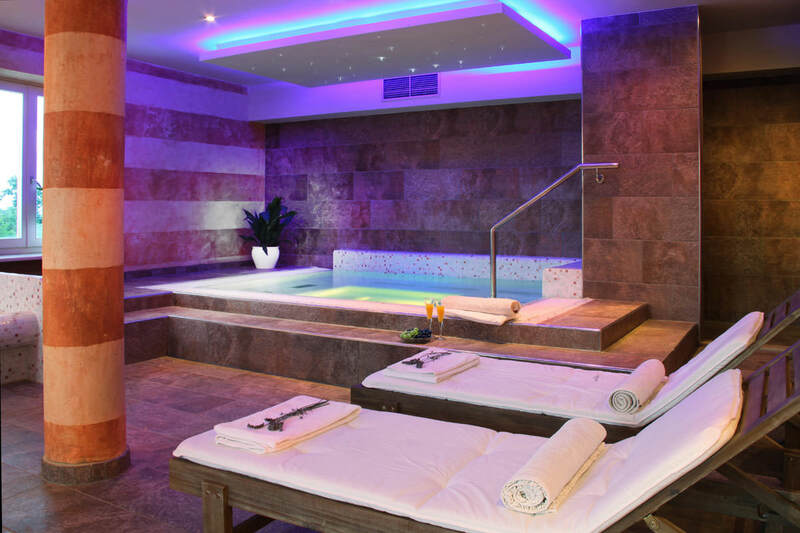 Lay back and treat yourself to a memorable holiday experience! 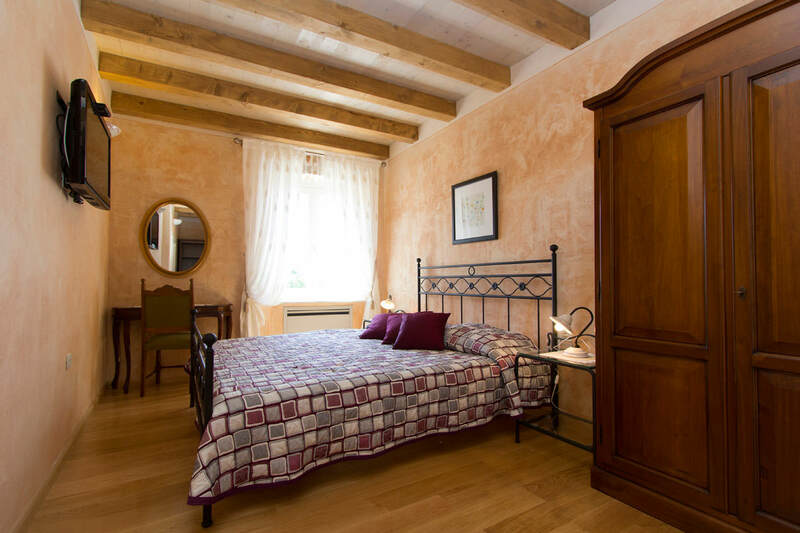 To help you choose the ideal period for your stay, we have prepared several special offers. 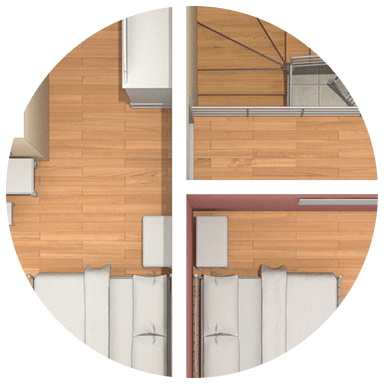 Find out what's best in individual seasons and choose the offer that suits your needs and interests. 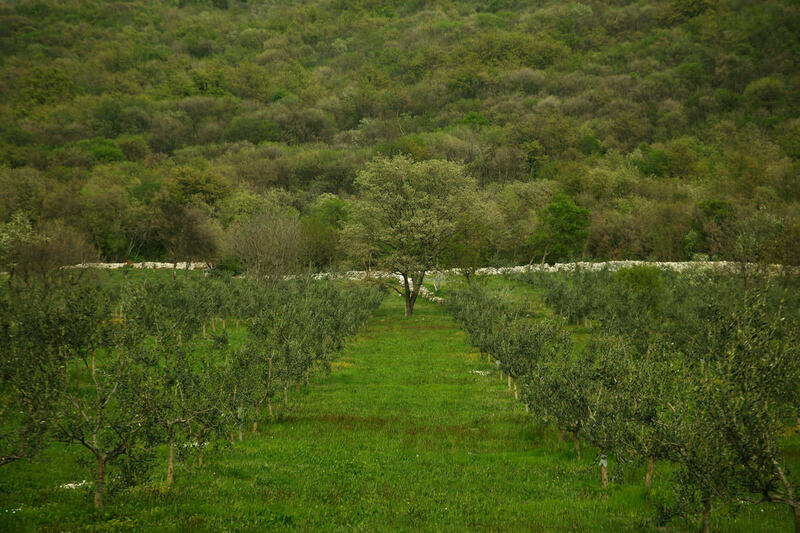 On our estate, we have planted an olive grove with varieties indigenous to Istria and the Kvarner region which we are particularly proud of. 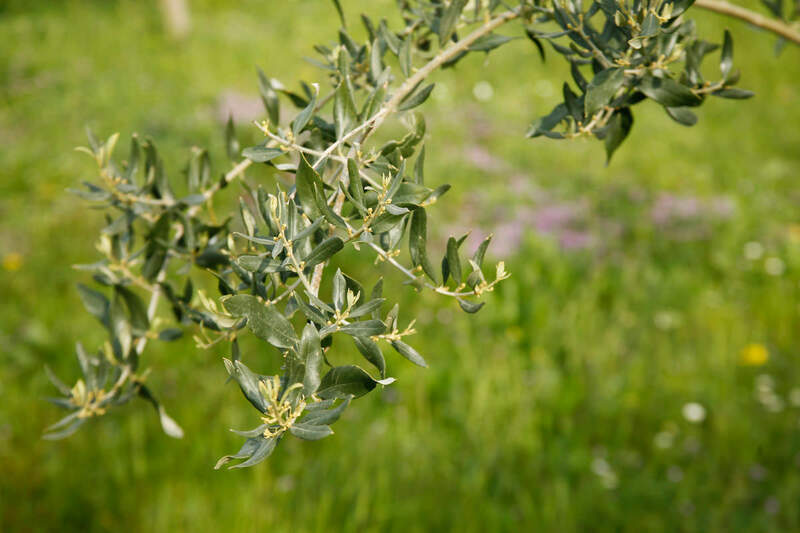 Using the traditional cold pressing technique, we produce top-quality extra-virgin olive oil which is distinguished by its fresh scent and aroma. 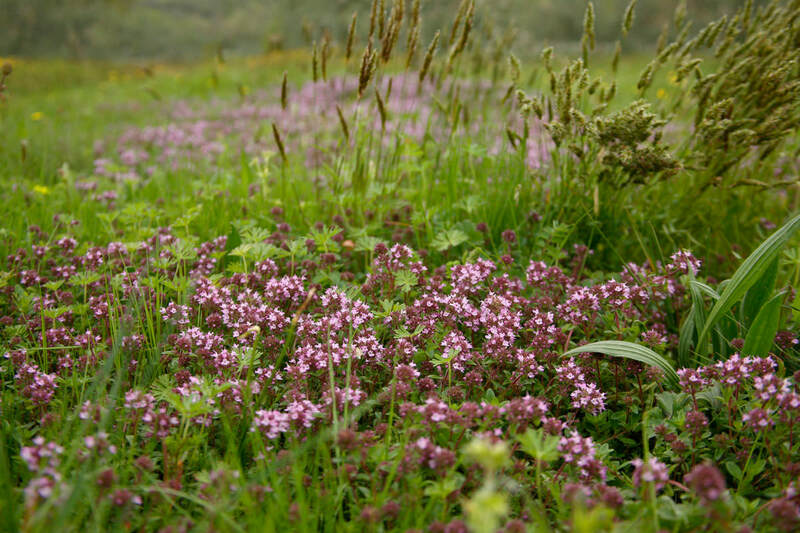 Its colour is of a golden-green hue, the scent is reminiscent of mown grass, and the taste is characterised by a pleasant bitterness and pronounced spiciness. 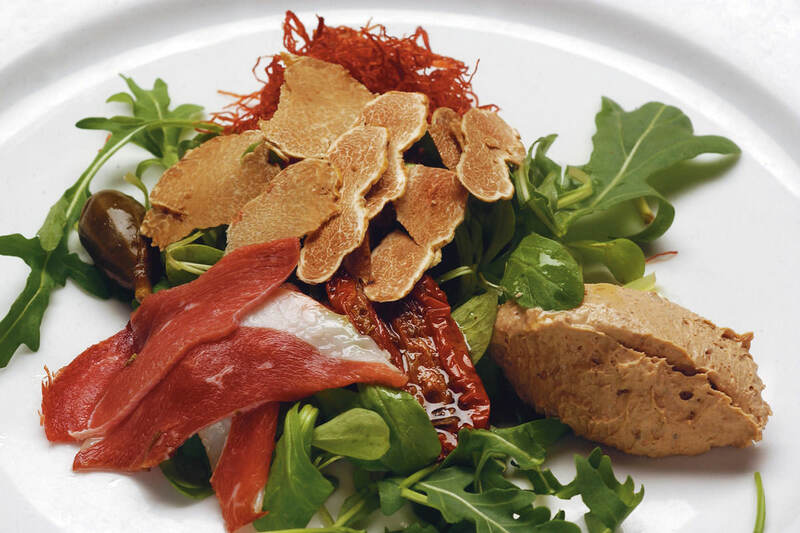 It goes well with meat dishes, especially beef and lamb, and hard cheeses. 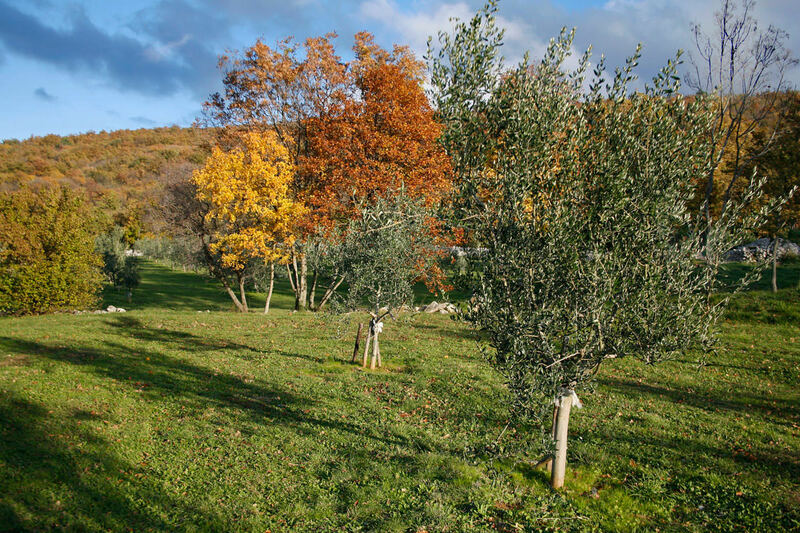 We pick the olives while they are still green and have them processed in the nearby olive mill on the same day. 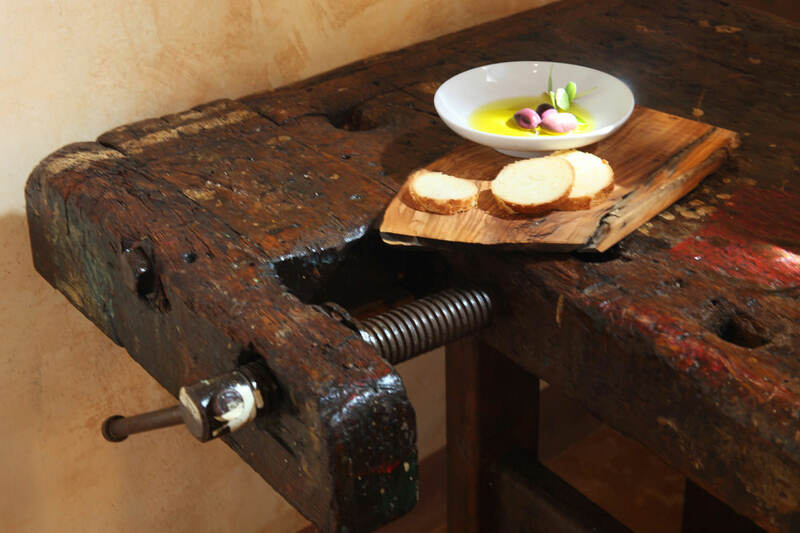 In Roman times, oil produced in this way was highly valued and known as Oleum Ex Albis Ulivis. 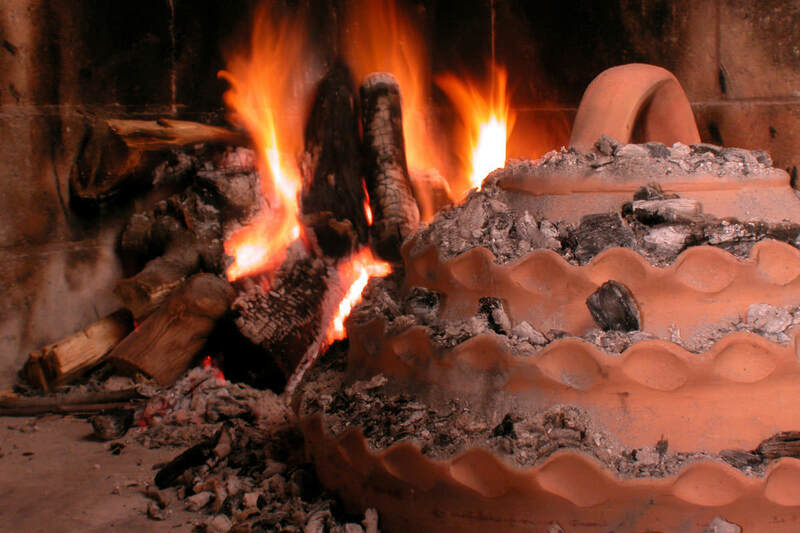 Being true lovers of olive oil, we will tell you the story of its origins. 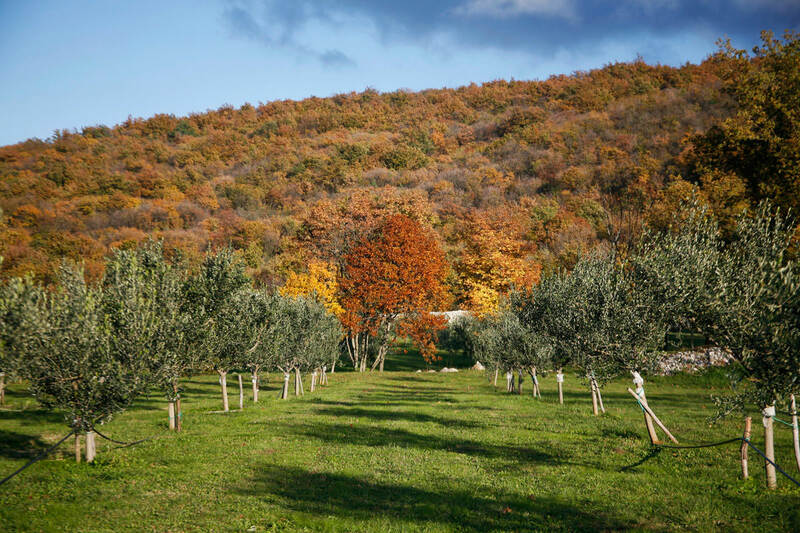 On our property, you can sample it, enjoy its aroma, and take it back home as a gift for your friends. 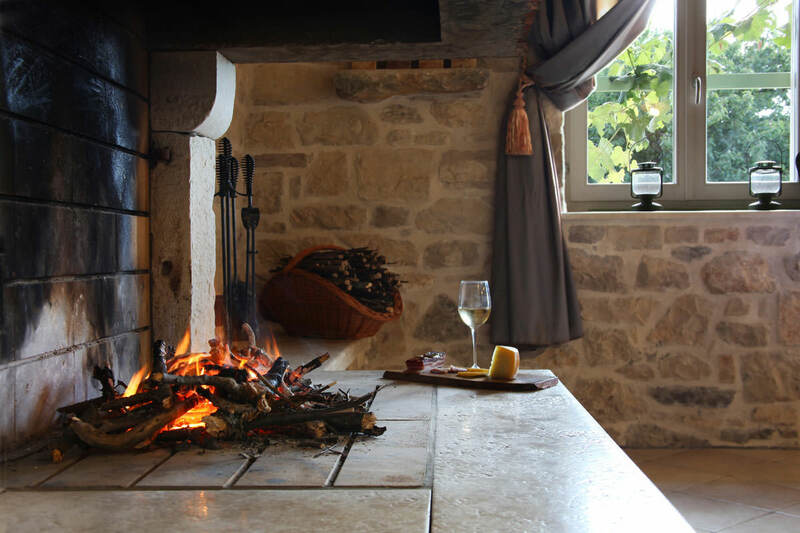 Morchaki Country Resort & Spa is situated in the heart of Istria, a fascinating peninsula in the north of the Croatian Adriatic. 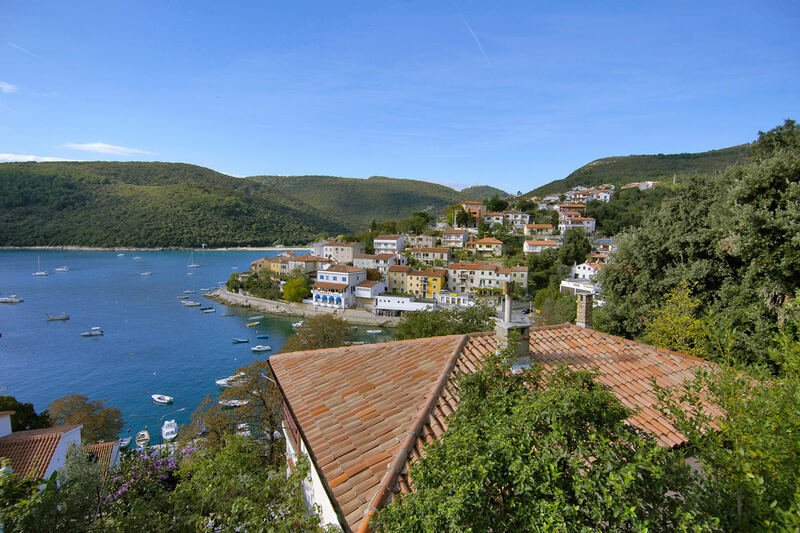 This is a region distinguished by its contrast of blue sea and green hinterland landscapes, white limestone and red soil, fashionable coastal resorts and traditional hilltop towns in the interior. 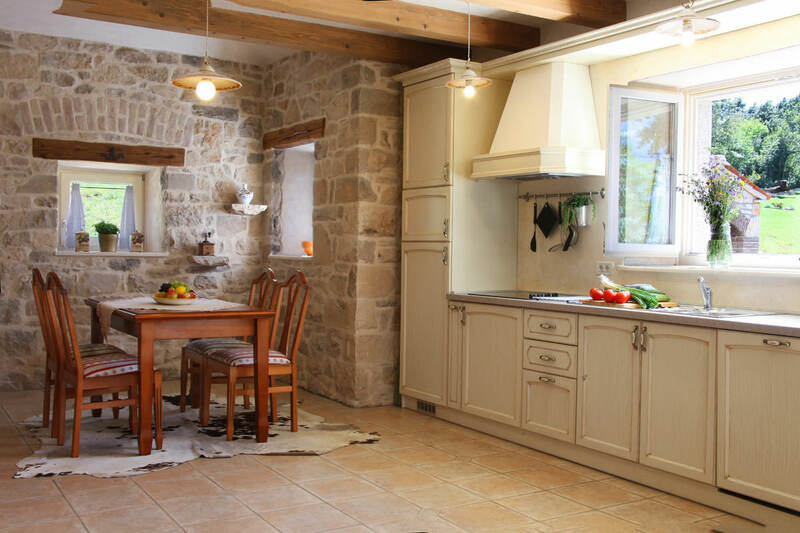 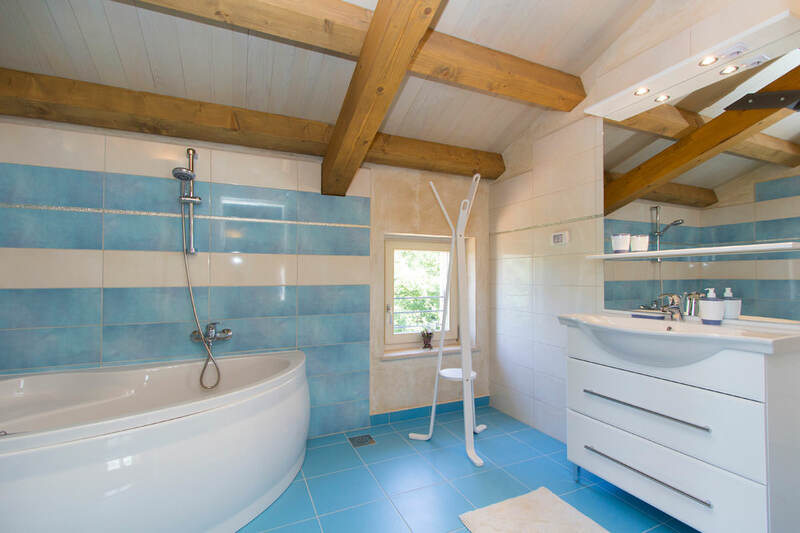 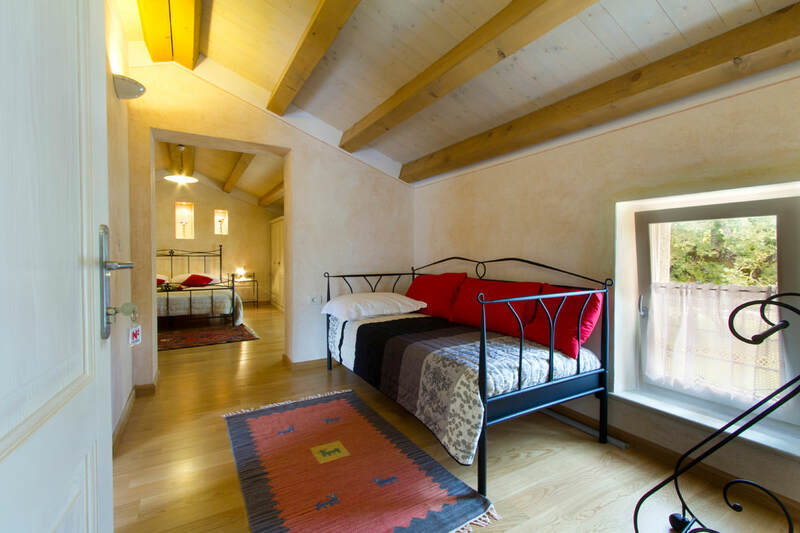 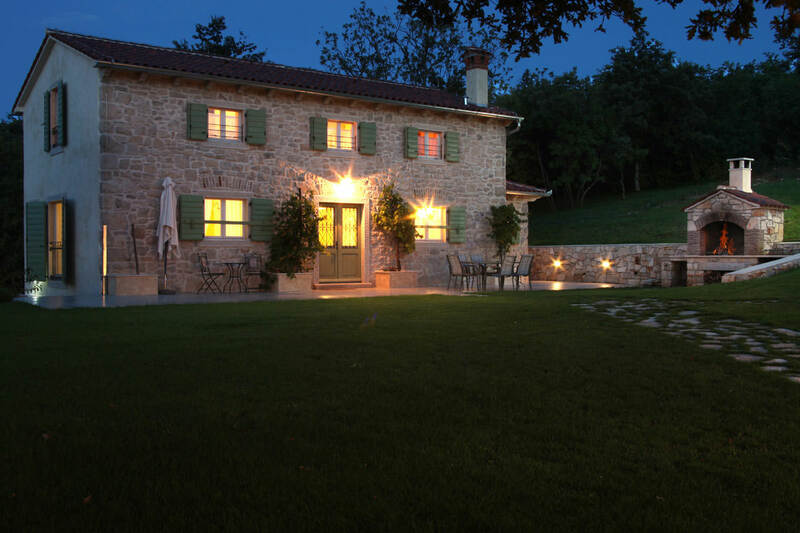 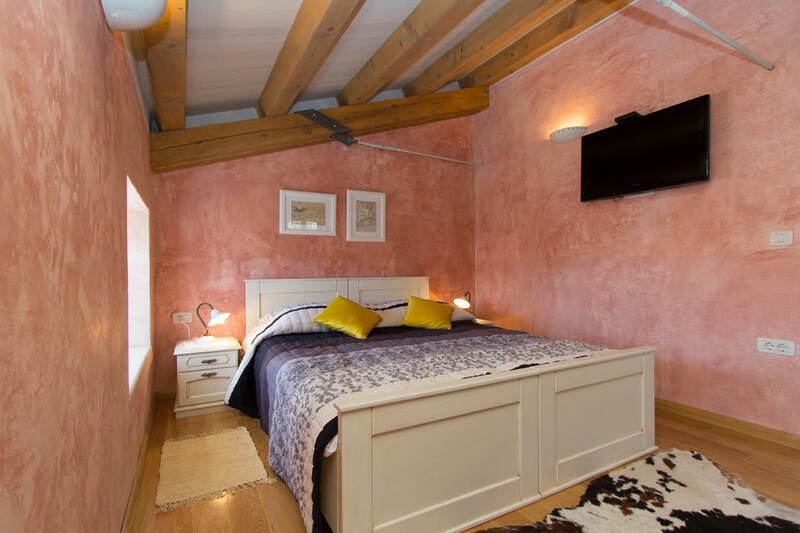 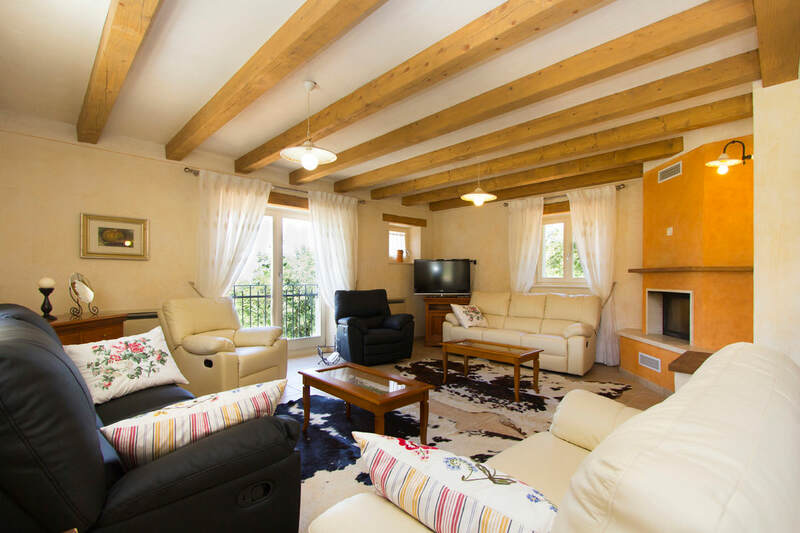 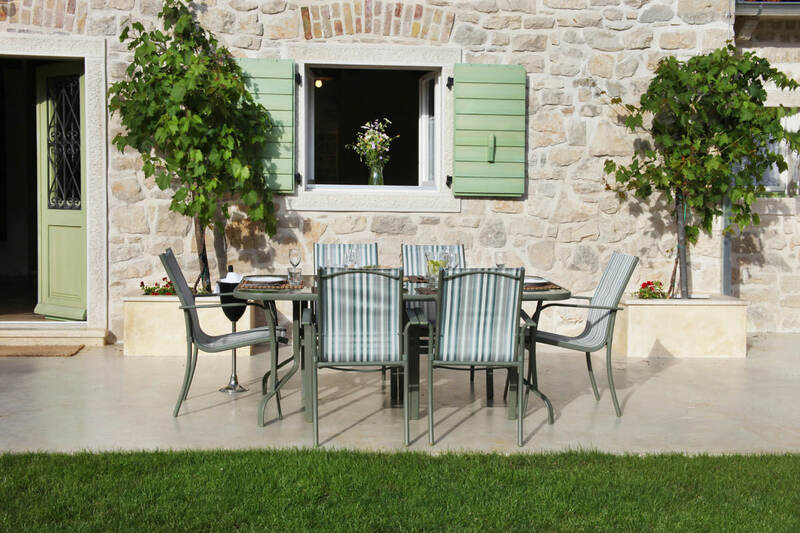 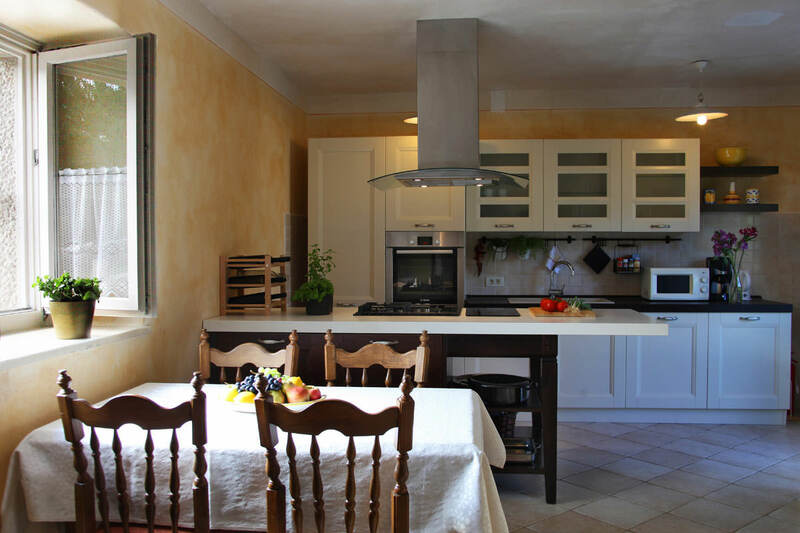 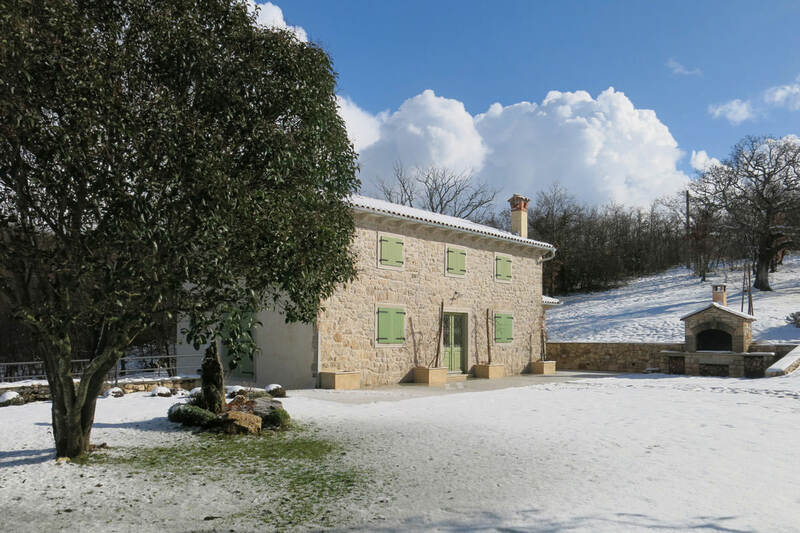 Near this holiday house, there are two famous and wonderfully contrasting Istrian destinations. 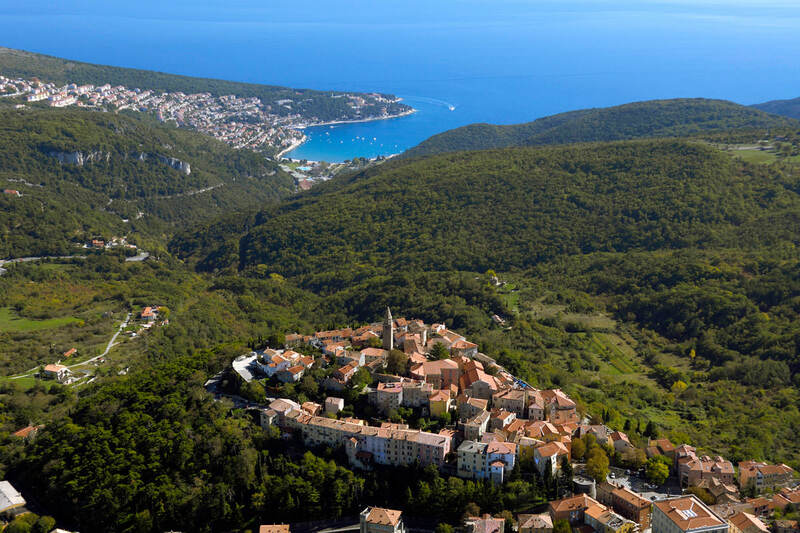 The first is Labin, a small medieval town rich in art and culture, which is situated on top of a hill. 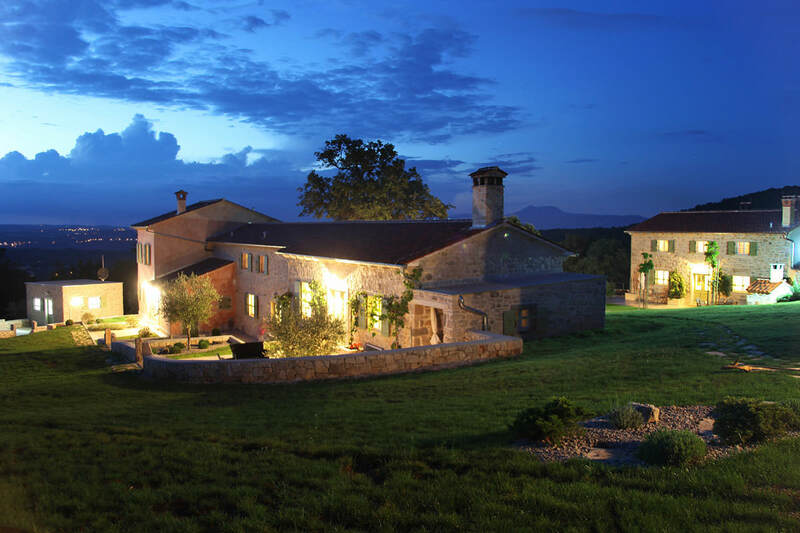 Its stone-paved streets and façades steeped in history exude the spirit of times gone by. 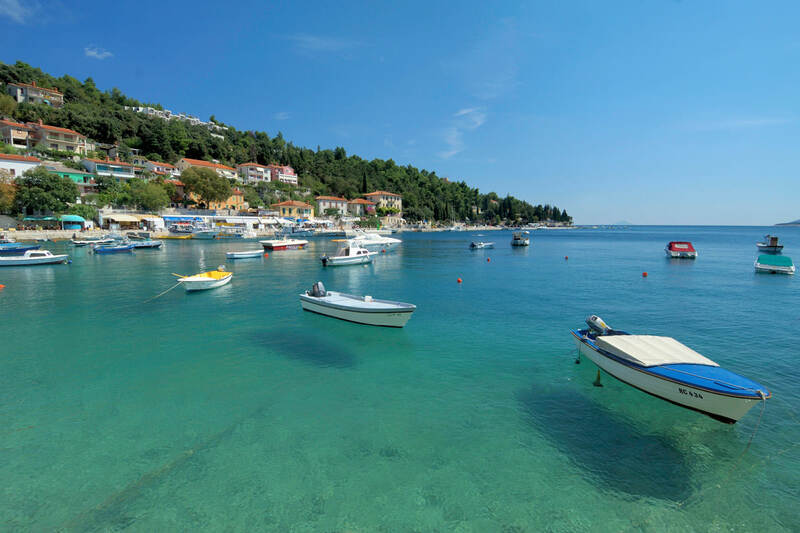 The other is Rabac, a vibrant tourist resort with beautiful beaches. 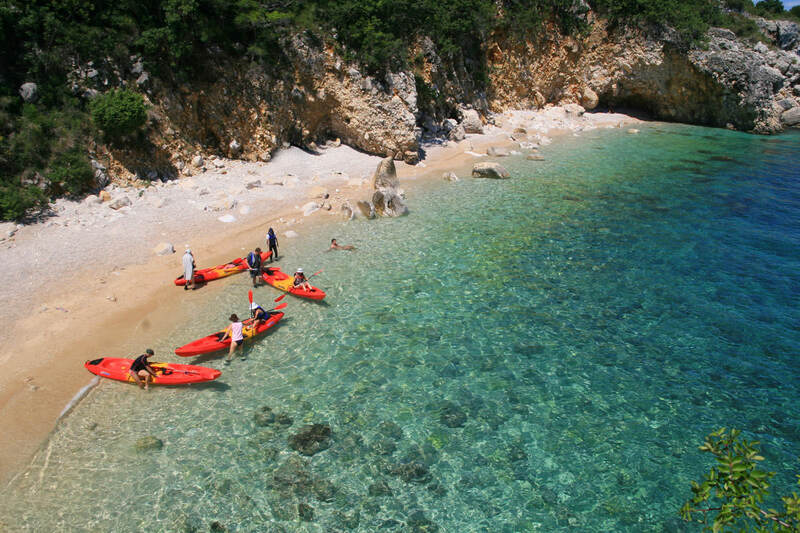 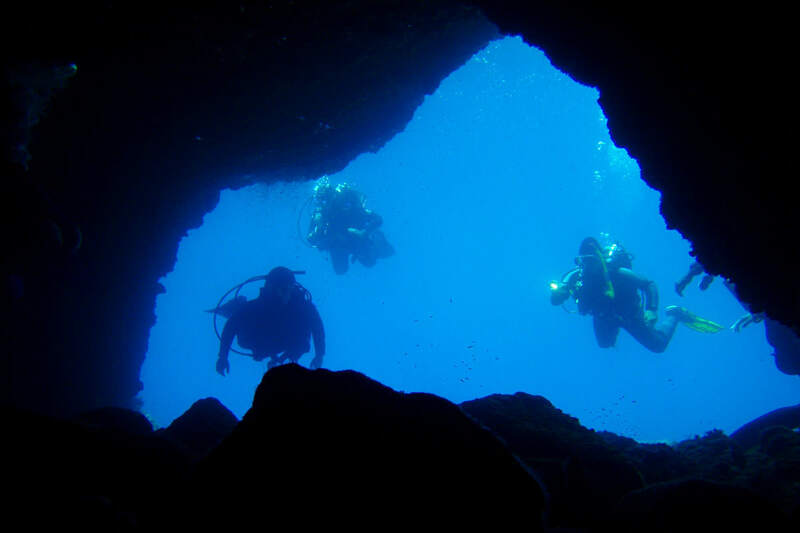 The range of activities that you can do during your stay is endless. 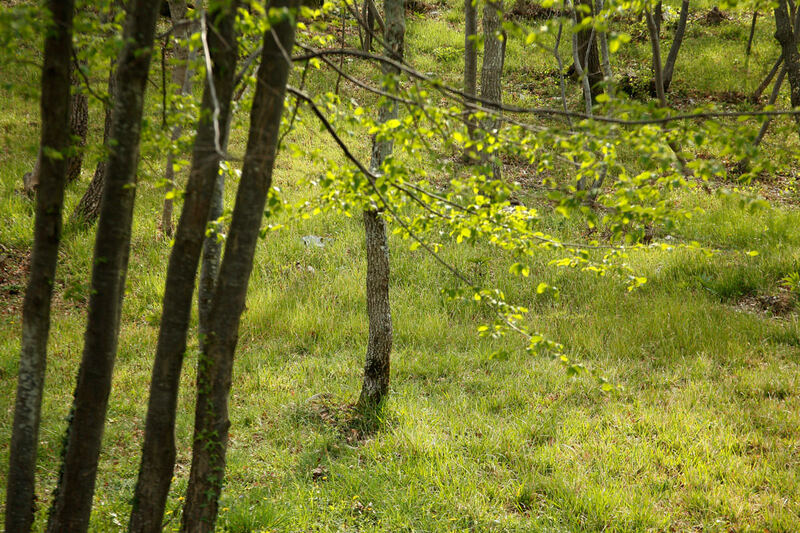 The surrounding meadows and forests invite you for pleasant strolls or trekking tours. 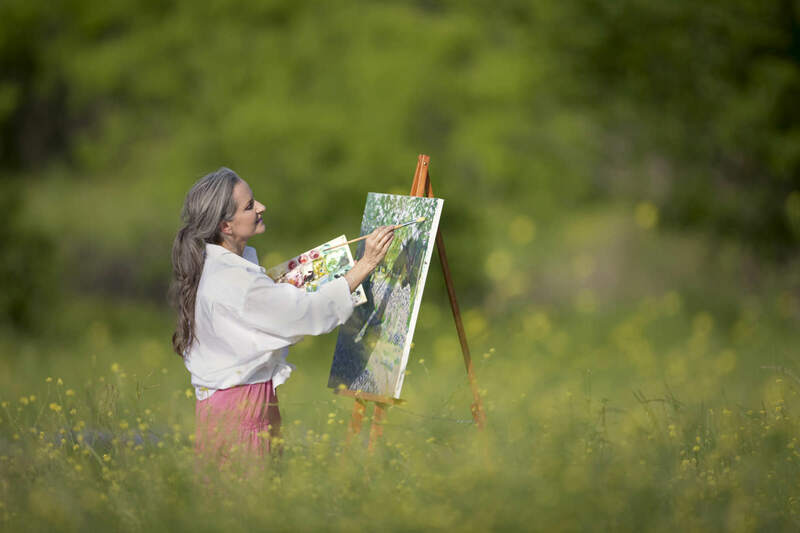 The picturesque landscapes are an inexhaustible source of inspiration for artists. 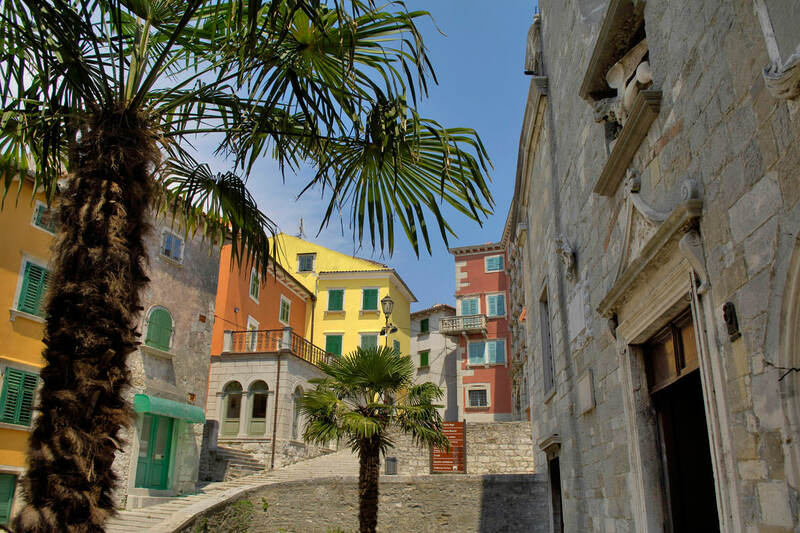 The old town of Labin will enchant any lover of history and culture. 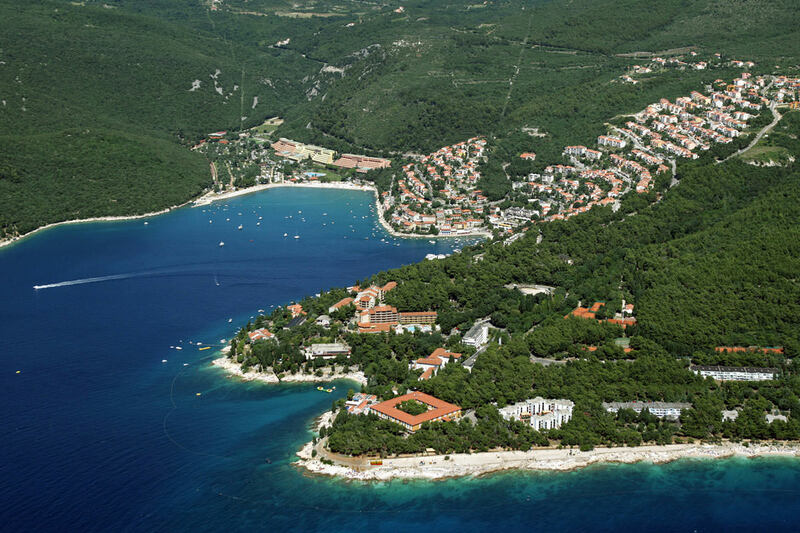 On the coast below lies Rabac with its promenade, beaches and seaside resort atmosphere. 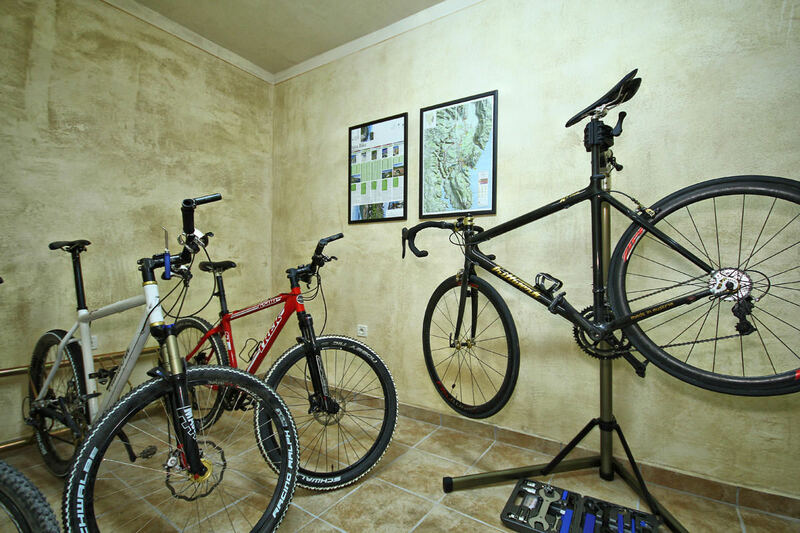 You can explore the surroundings on cycling trails and leave your bicycles in the bike room. 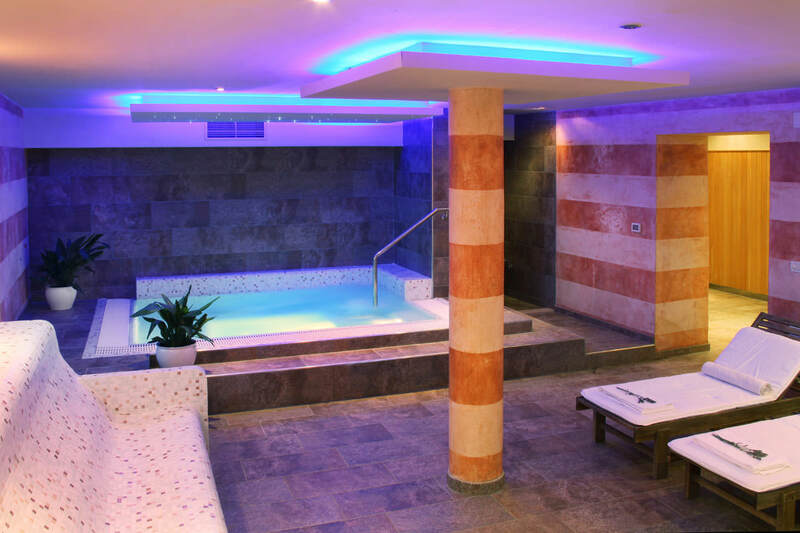 Our recommendation is to round off your day relaxing in the sauna or whirlpool tub. 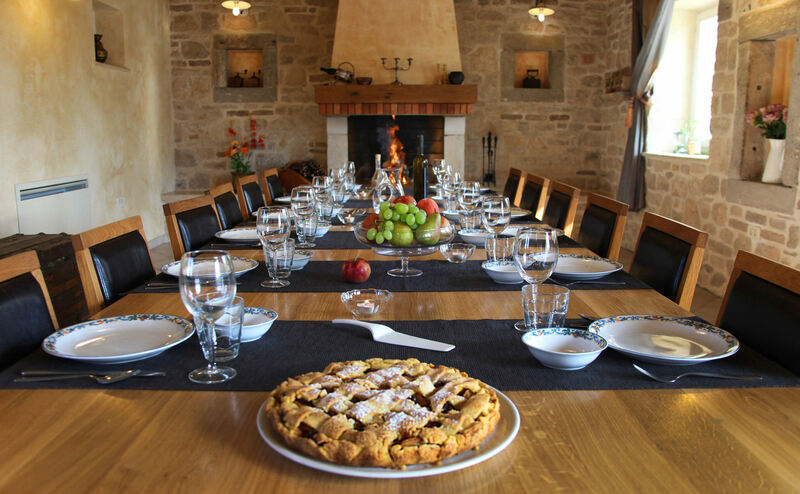 We can also arrange various additional services at an extra cost, such as catering or food prepared in the traditional way on a fireplace. 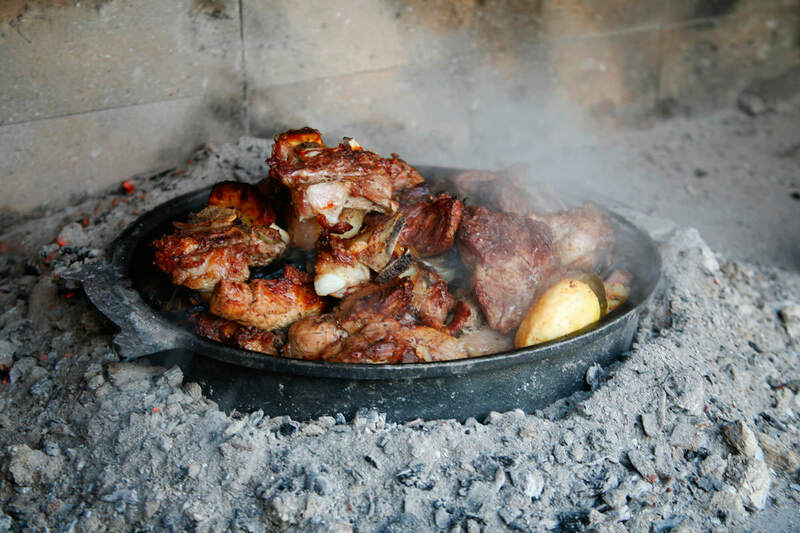 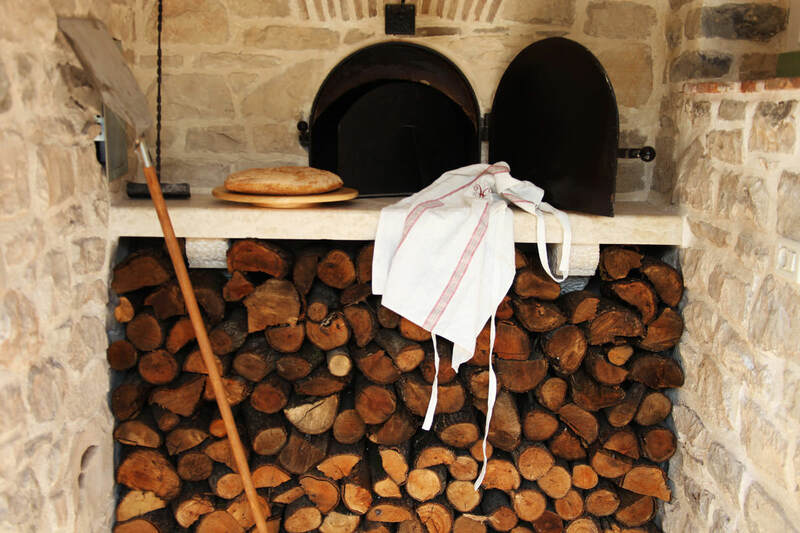 If you are interested in the local cuisine, look for restaurants, traditional 'konoba'-style taverns and agritourism facilities that serve superb dishes prepared with local ingredients such as Istrian truffles, pršut dry-cured ham, cheese, wild asparagus, Istrian beef, fresh fish and seafood, home-made pasta and other specialities. 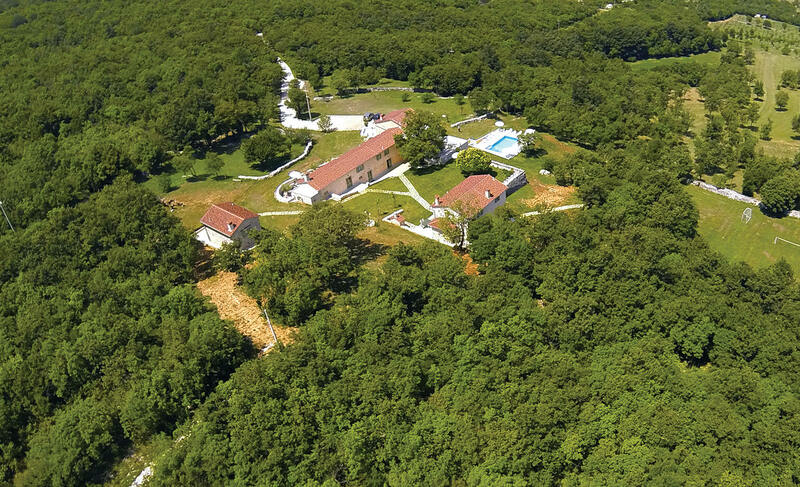 Take advantage of Morchaki Country Resort & Spa's favourable location in the heart of Istria to explore the surrounding areas and learn more about the natural landscapes, local culture, cuisine and traditions. 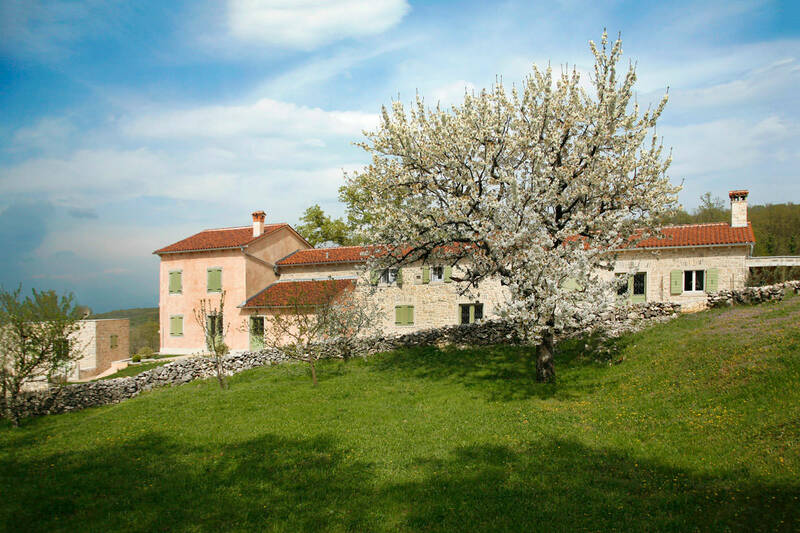 Istria is a small region and peninsula where any place of interest on the coast or in the interior can be easily reached in less than an hour's drive. 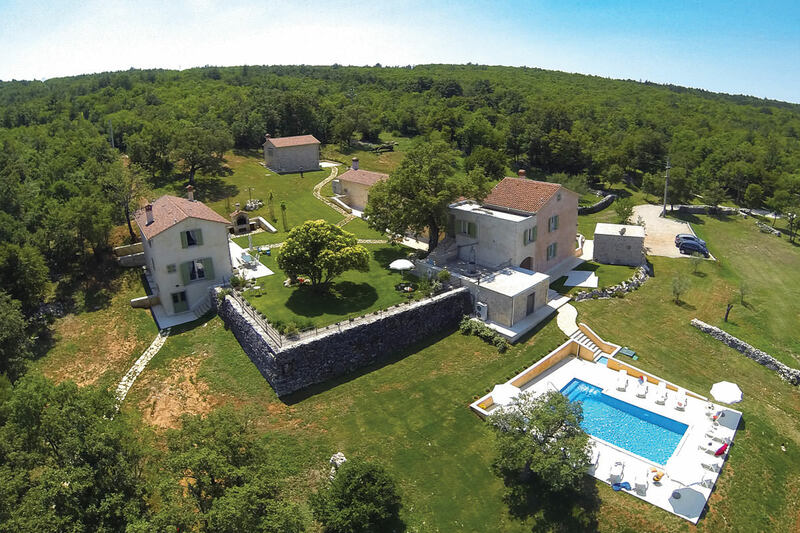 Morchaki Country Resort & Spa is situated on the eastern coast of Istria near Labin and Rabac in a location that is very easy to reach. 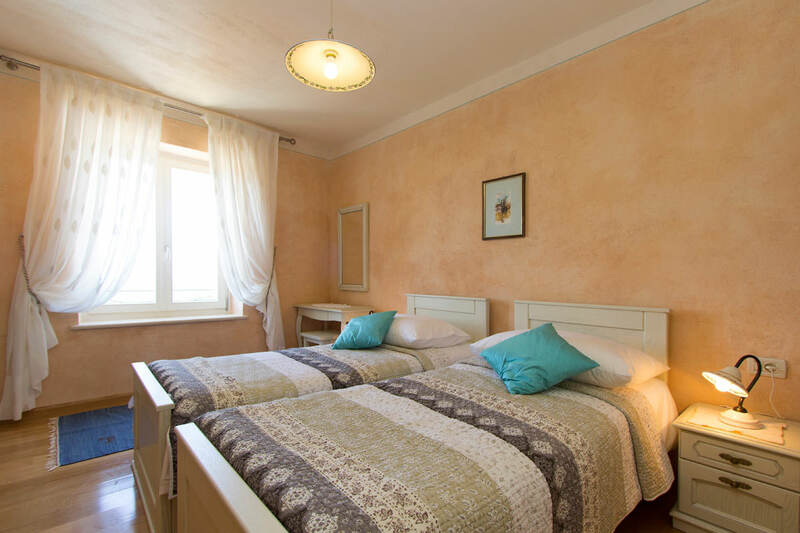 Thanks to excellent transport connections, you can easily get here by car or by plane, as Pula Airport is only forty kilometres away, and Rijeka Airport eighty. 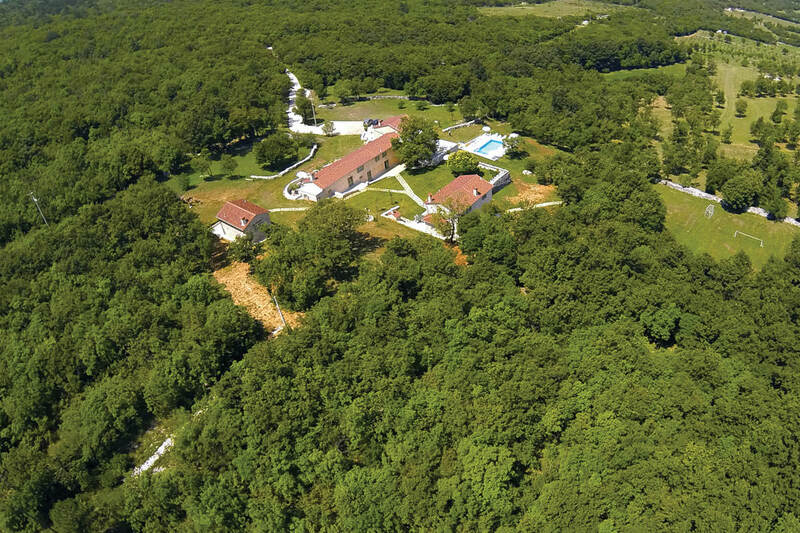 If you are coming from Western or Central Europe, you will most probably cross the Croatian border at Požane near Buzet. 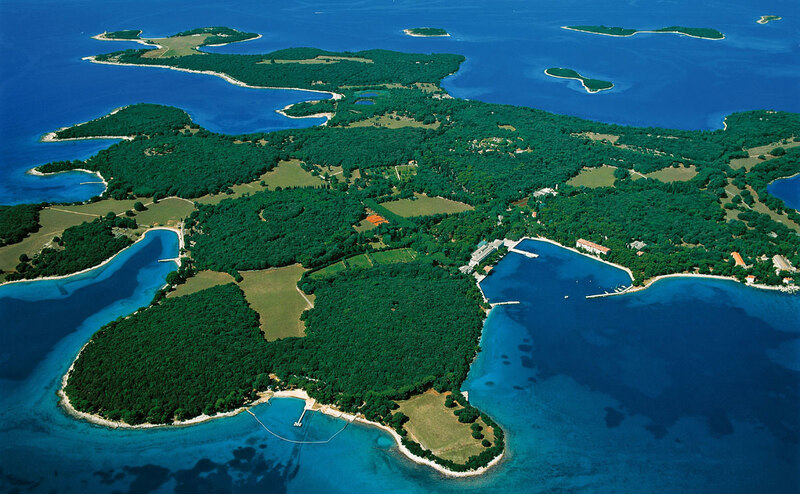 From there, proceed via Lupoglav and Vozilići to Labin. 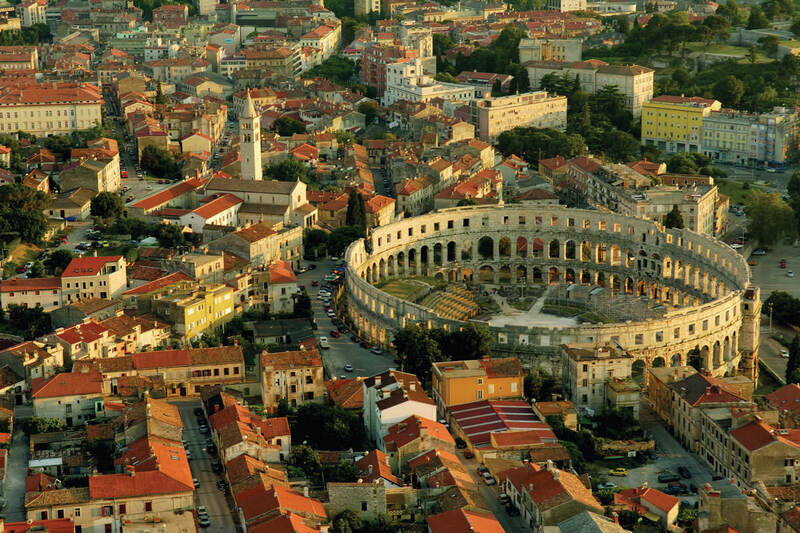 At the second roundabout, take the first exit to Pula. 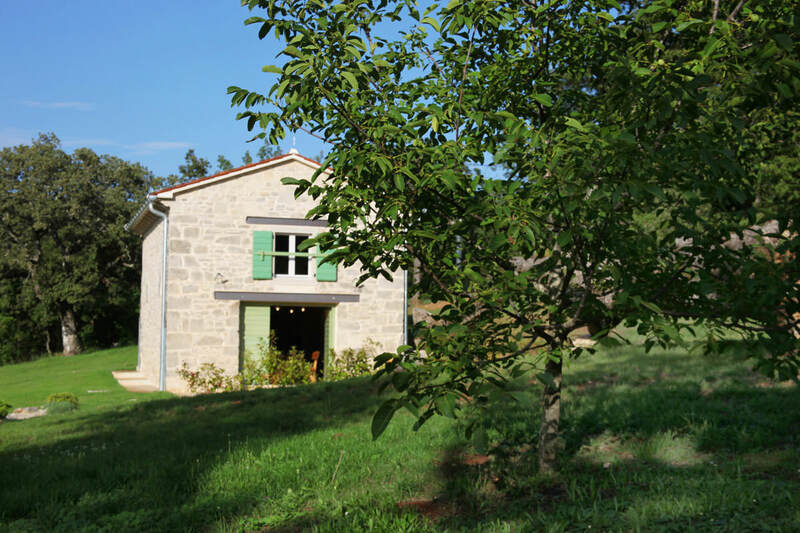 After 1 km, at the next roundabout, take the second exit to Koromačno. 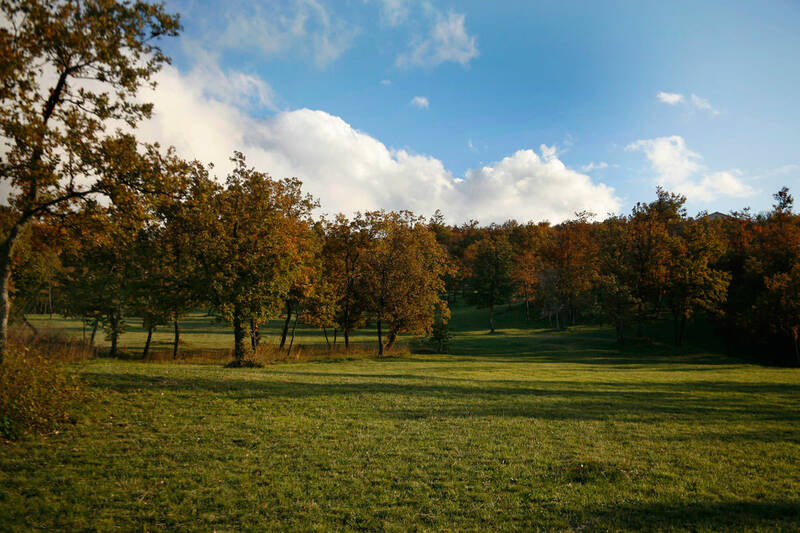 Continue for 5 km until the turning for Gora Glušići and after 1 km you will get here. 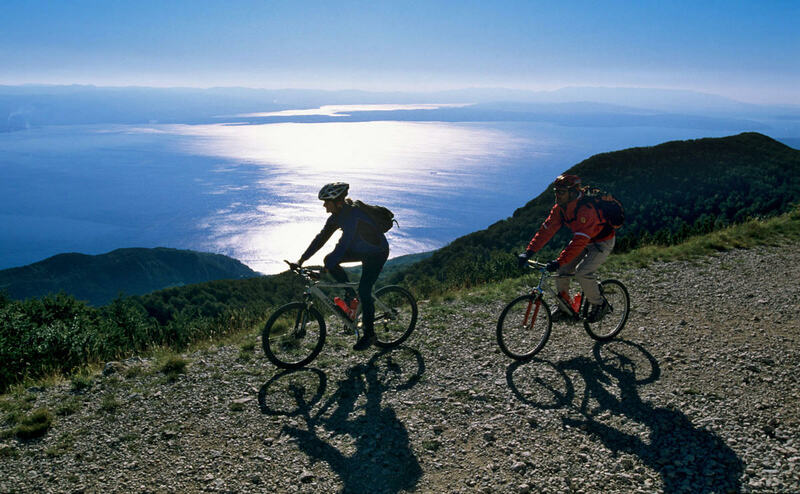 If you are coming from the direction of Zagreb or Dalmatia, take the highway to Rijeka, and then continue along the coastal road to Plomin and Labin. 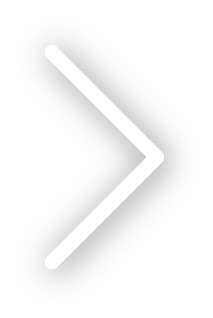 Alternatively, from Rijeka you can take the highway (the Rijeka bypass) for the Učka Tunnel, and then to Vozilići and Labin. 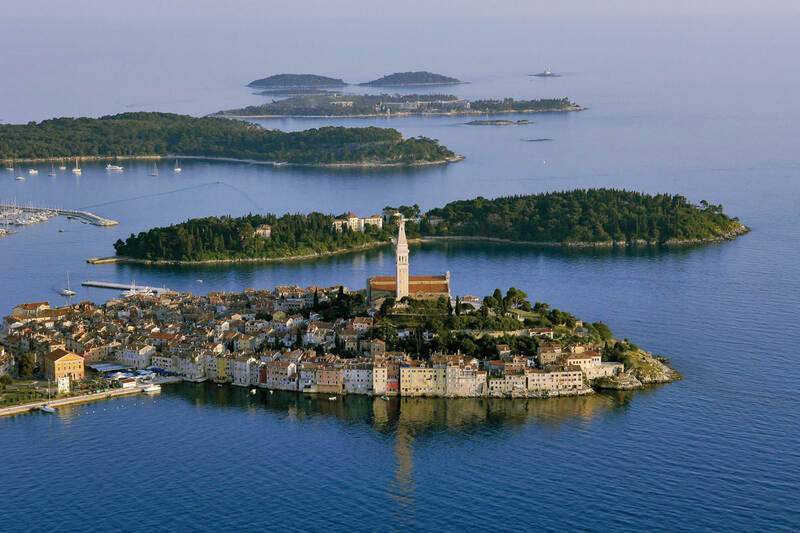 If you are coming on a scheduled flight, you will land at Pula Airport, Istria's biggest international airport, located only 40 km from Labin. 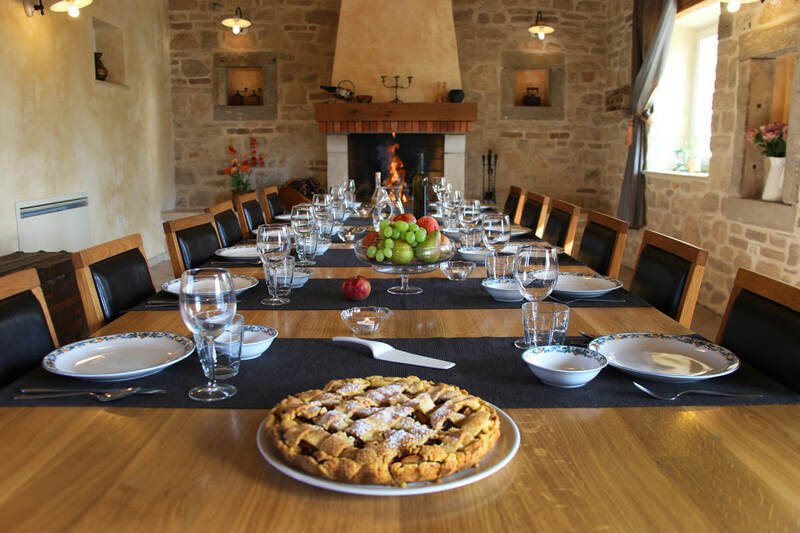 To get to us from there, you can take a taxi, bus or shuttle service organised for you by Morchaki Country Resort & Spa. 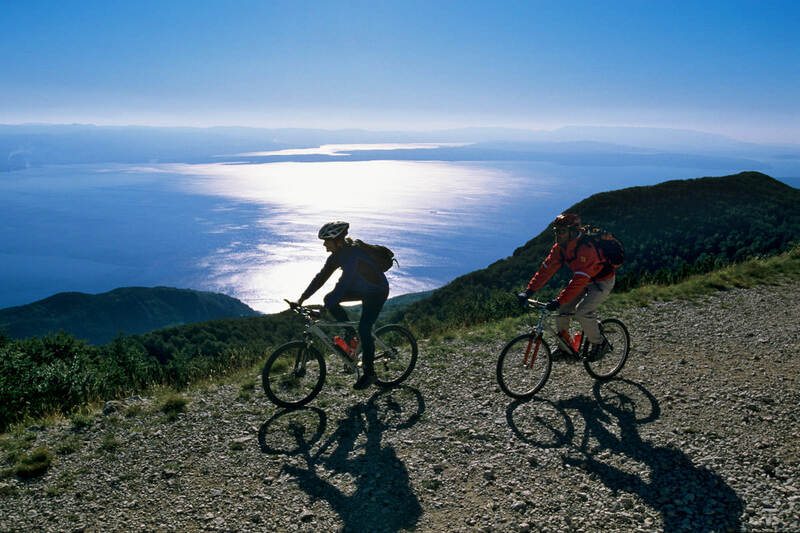 Another international airport in the vicinity is Rijeka Airport.